I will just give you a little insight into the story about this build. 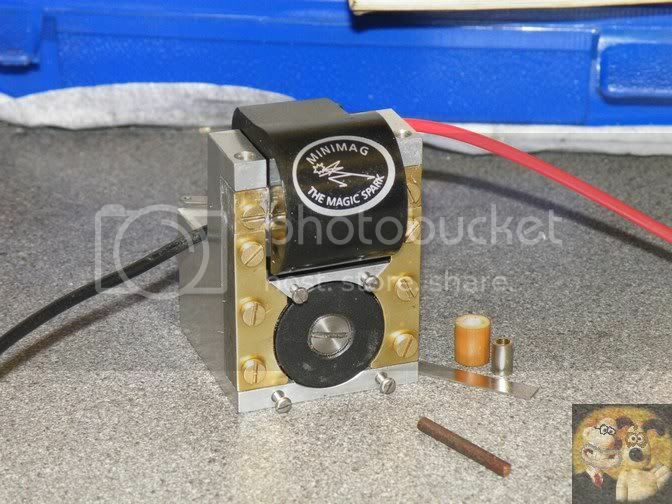 A magneto allows you to run an i/c engine without all the usual points, coil and battery. 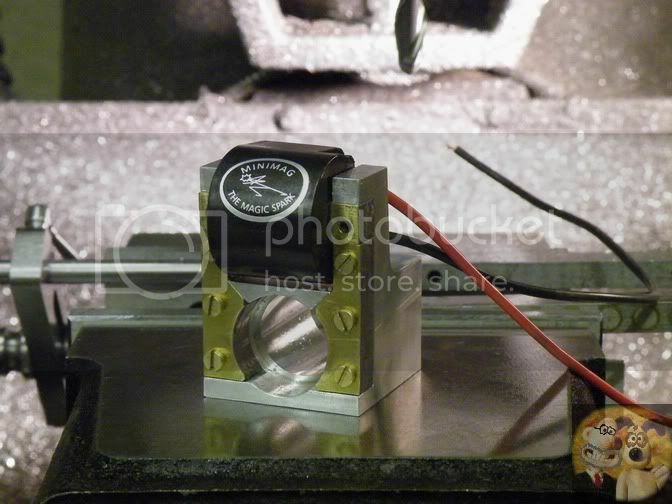 Except for the battery, everything to produce the spark and to time it correctly is in the magneto, which can be driven off the crankshaft (lost spark method) or from the camshaft running at half engine speed. This is of course for a 4 stroke, they run just as well on 2 strokes, in fact, most modern weed wackers use them on their engines. A chap called Jim Shelley first came out with the Minimag, but due to ill health, had to stop producing them a few years ago. A few years down the line, the plans and most of the building materials were purchased by a person called Julian. To cut a long story short, he needed one to be built using the plans he had made up using more modern components, that job fell onto myself. I needed not only to make the thing, but also change any incorrect dimensions as I came across them. 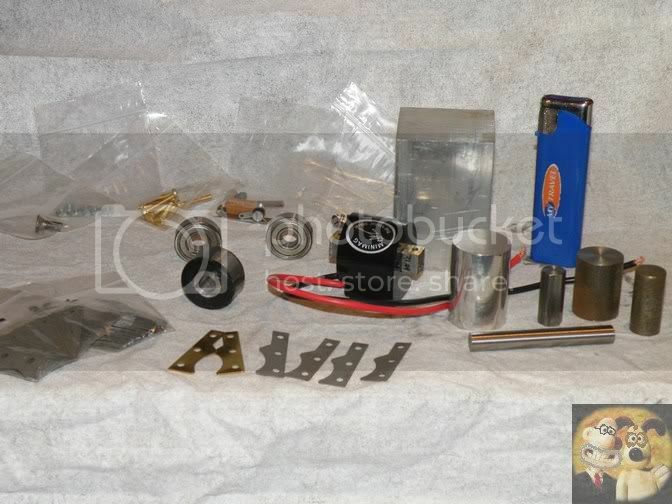 I have got to say, this is a VERY complete kit, absolutely everything you need to make the unit except for a bit of superglue, a dab of loctite, and of course a bit of machining. 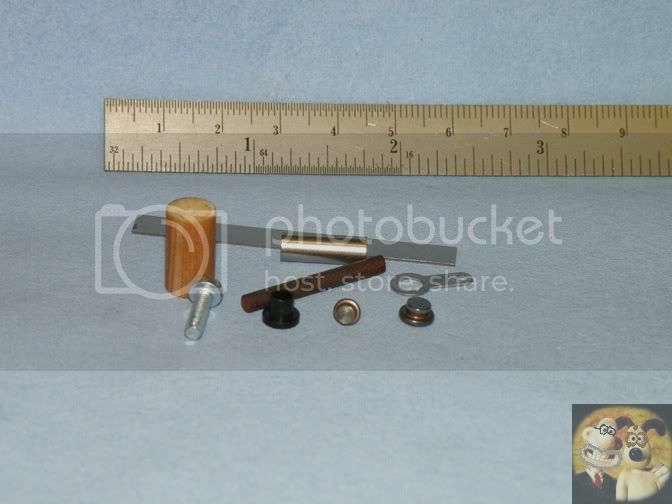 It is made up from a couple of different standards of fixings, all metric with just one bit of ME threads. But I suppose this is to take advantage of the cost of parts involved as it might be both cheaper and easier to source something like metric bearings and fasteners rather than imperial ones. The plans are also marked up in both standards, where needed. Things like that don't bother me at all, just take a bit more care as you do things, one good part at a time. 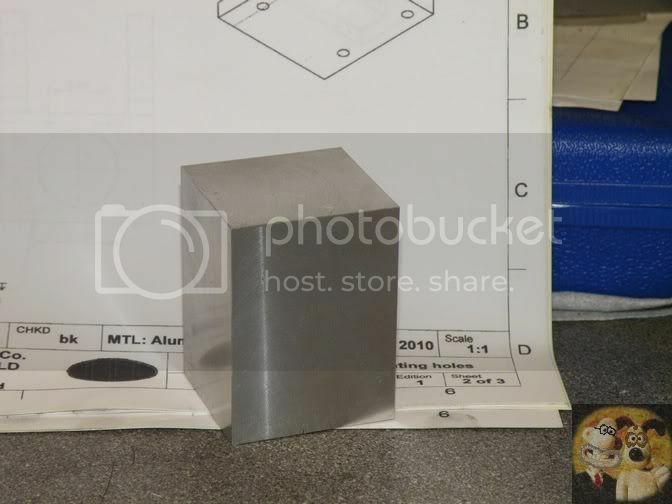 There is even a little bar of tufnol (or something similar), spring steel flat and a couple of tungsten rivet contacts supplied for making the points setup, as I said, everything is included. The lighter in the shot gives some sort of scale. 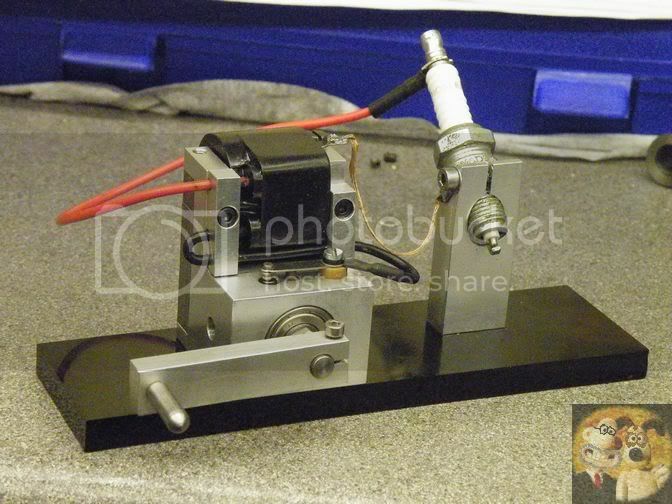 I was at one time going to make one of these from scratch, from the book by the late Bob Shores, but the things that always put me off was winding the coil and making the punches for all the laminations (both coil and magneto). For a one off, a great deal of work. No trouble on that score with this stuff. The coil is a work of art, fully potted, moulded to shape and sealed, not like a lot of model coils I have bought and used before, with their outer casings made from rolled cardboard, then all potted up with a soft wax like substance. This one really is the bees knees. 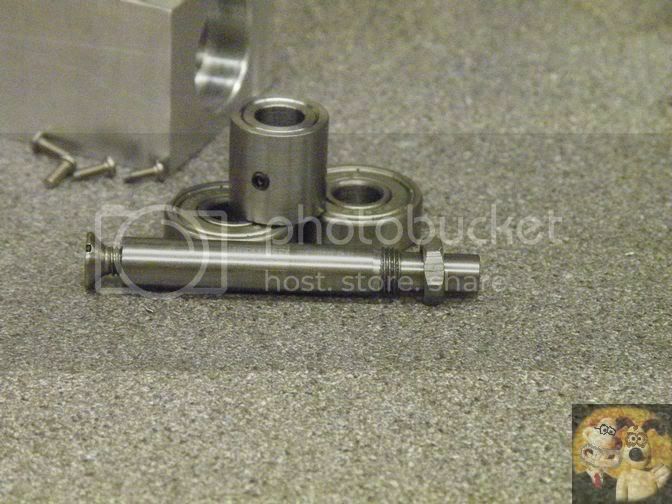 The strong magnet rotor is the same quality, fully potted and machined to size. The laminations, are again, very well made, crisp cut, and on my kit, supplied as two sets, one left hand, one right hand. 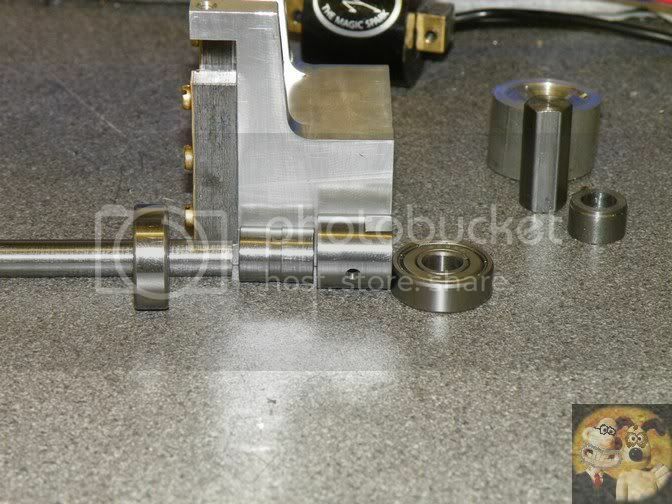 The final main bits are the two roller bearings for the rotor shaft to run in. 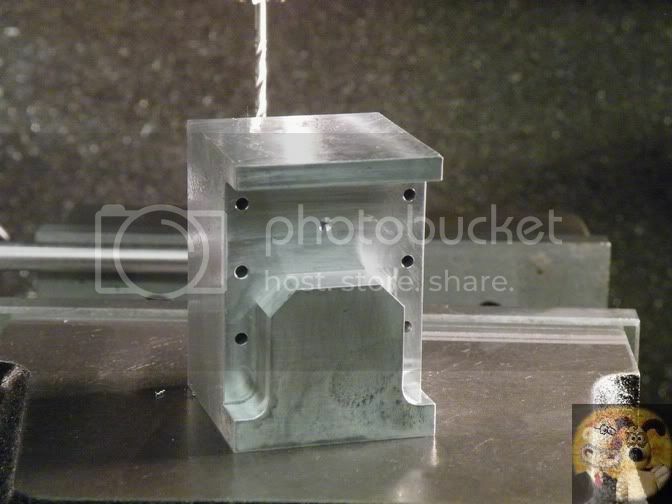 The main part of the machining is making up the support block from the lump of ali supplied. If care is taken, and the instructions followed, this should hold no terrors for anyone. It looks difficult, but if broken down into stages, it will emerge from the block like magic. I will be following, as close as possible, the pre production build sequence and plans that Julian has provided me with. He has requested that I show no dimensions on this pre production build, just in case things change a little before it is released to the public. I fully agree with what he has asked me to do. I will also be taking it a little deeper, giving a few hints and tips as I go along, so it should make healthy reading even for the novice, even if they are not needing one of these units. 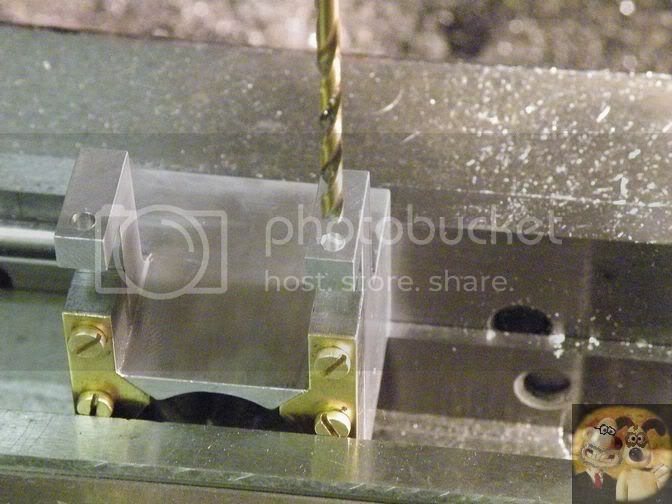 For the more experienced amongst you, I will be going thru the build showing how I do a few basic machining techniques, purely for people with lesser experience, so please excuse me if I show what you already know. BTW, if you can build an engine that one of these are required on, I see no problems at all in you building one of these. 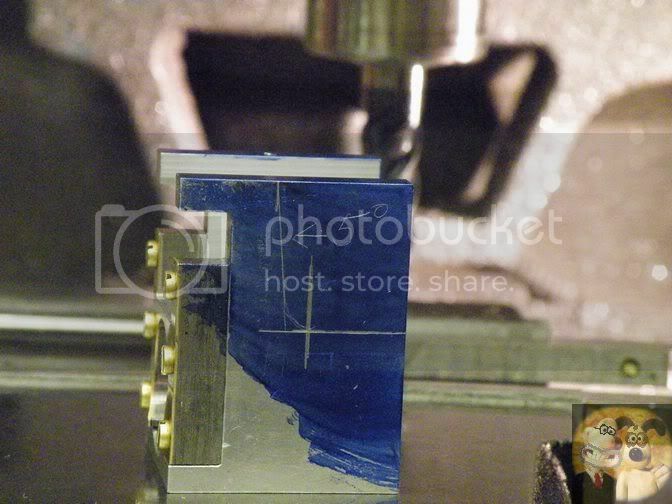 The very first thing is to assemble the supplied laminations. 32 pieces in each stack, one LH, one RH. After I put them together, I tightened up the screws and stuck a mic across them, just to make sure my count wasn't out, I came up with the same figure for both. The nuts were then slackened off slightly, and a small bead of superglue run across the flat back side of the lams, in two places on each stack, between the screws. The glue wicked easily in between the parts, so things were quickly tightened up, wiped off the excess, and put them to one side. They will be used later in the build. Whenever I come to do a new project on my machines, the first thing I do every time is get the machine ready to do a good job. If the machine isn't prepared, then expect crappy results. The first job was to have a good clean up of the machine followed by a lube of all points. 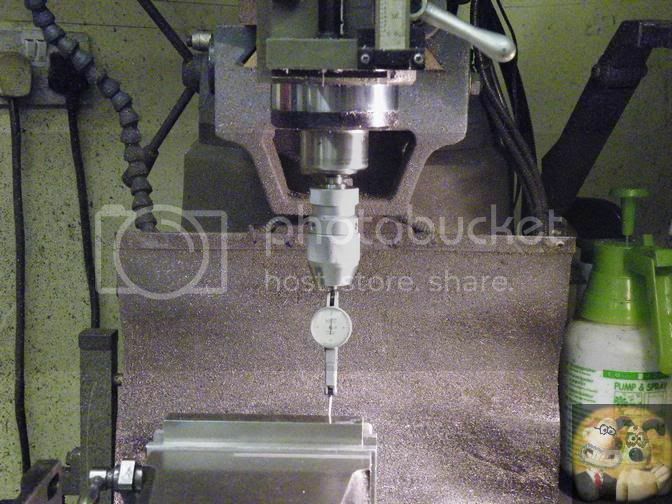 I am lucky in that I have one shot lube on my mill, but it is an important factor in getting precision. 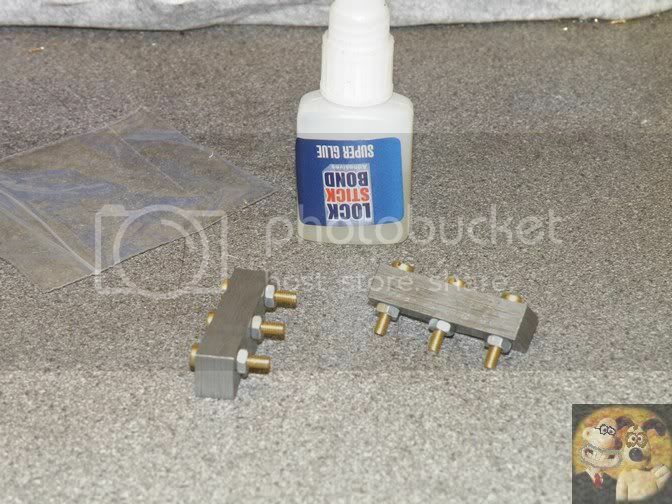 Oil forms a layer barrier between the metal working parts, it is that, if it is not there or 'topped up' can easily give you error of a couple of thou, so at the start of each working day, lube up. 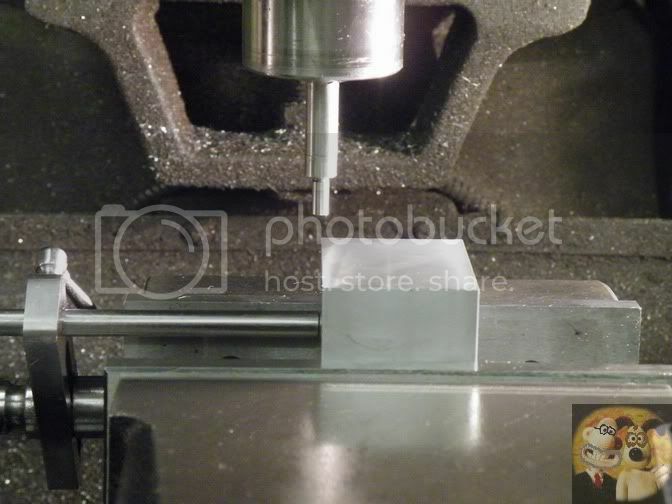 The next part is getting you machine to cut straight, flat and square. I go thru this routine religiously, even though not required. With a DTI in my chuck, and a thick parallel in the vice, I sweep across the fixed jaw side from one side of the jaw to the other. If you don't have a parallel like this, and your vice fixed jaw face is in good condition, you could swipe along that. 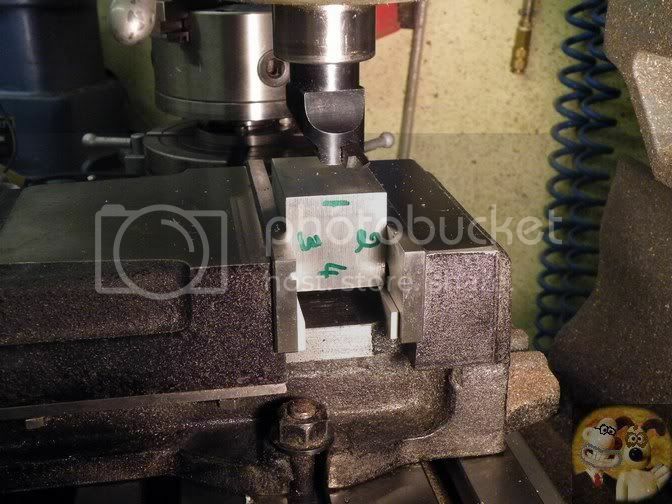 It should read the same all the way across, if not, adjust the vice position until it is. Mine was still spot on, mainly because I have a bar on the bottom of my vice that locates into the table slot, and keeps it that way all the time. I just did this to show you what is required. Next comes one of the most important bits, tramming the head. You might not think this is necessary, but without getting it spot on, what you think is a nice flycut flat surface just isn't, it will have a concave dippy down in the middle. 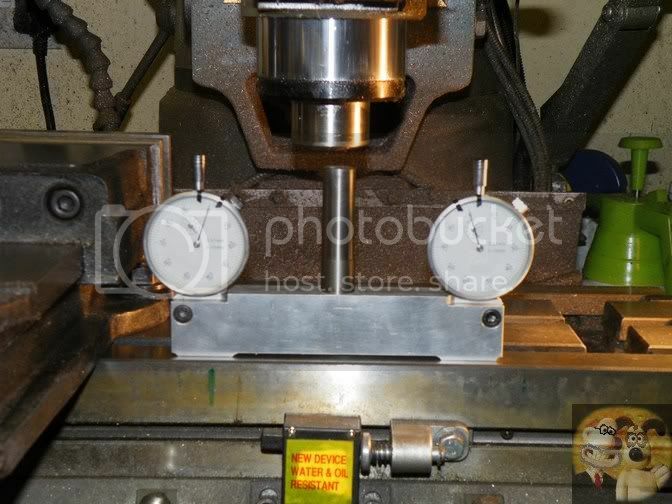 I made my own tramming tool, so it was laid on the table and the two gauges set to zero. You will have to find a way of doing your own tramming exercise if you haven't made one of these yet. 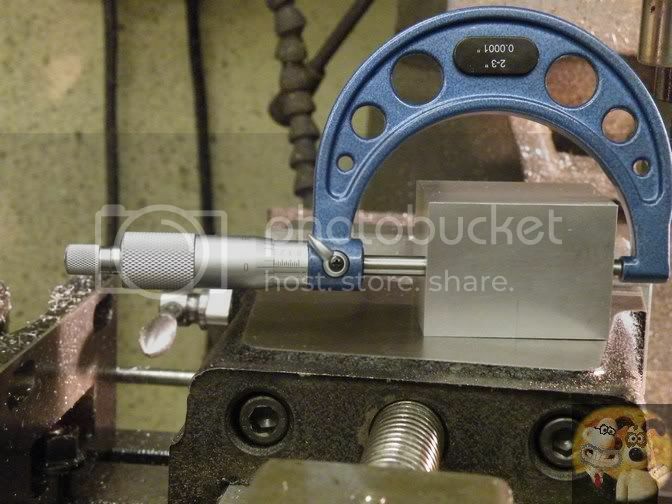 Tool now mounted into the spindle collet and brought down until at least one gauge reads zero. As you can see, my tram is out, not by far, but it needs putting right. Swiveling the head a tiny amount soon had it spot on again. Only last week, I was having a discussion with Stew about how a lot of people can achieve a nice flat face on the job, but just can't get it square to a face adjoining it. This is how I get faces square to each other when starting off with raw materials. I get everything square first, then bring them down to size. 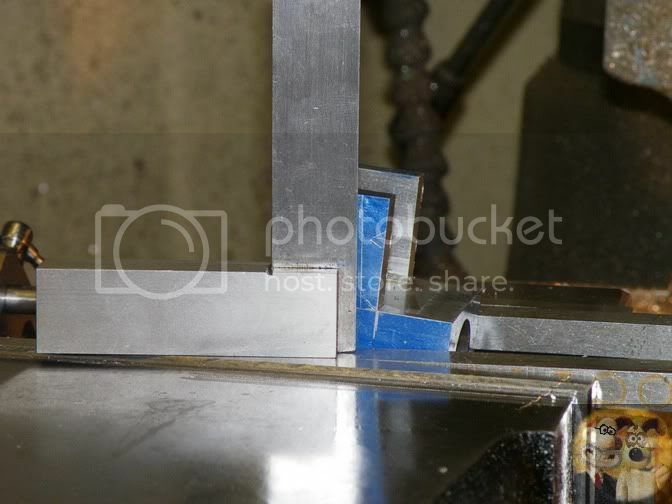 Mark each end of the rough cut bar as shown. If bringing round to square, you machine the first flat and call it number 1, then carry on the same routine as this. 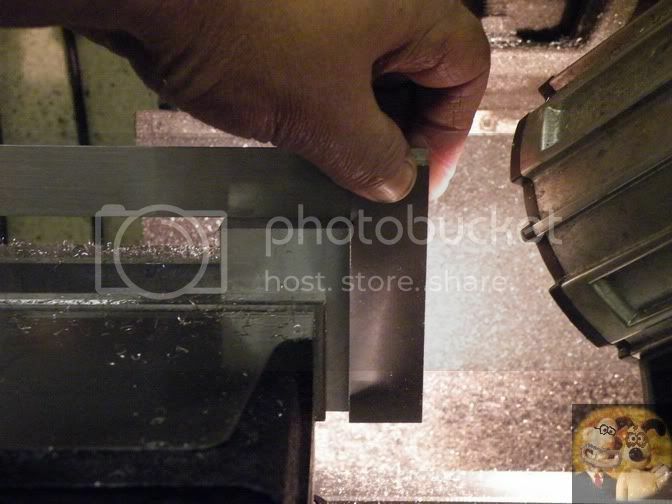 Then using your sharpest cutter, just clean up the face until all rounded corners are gone. 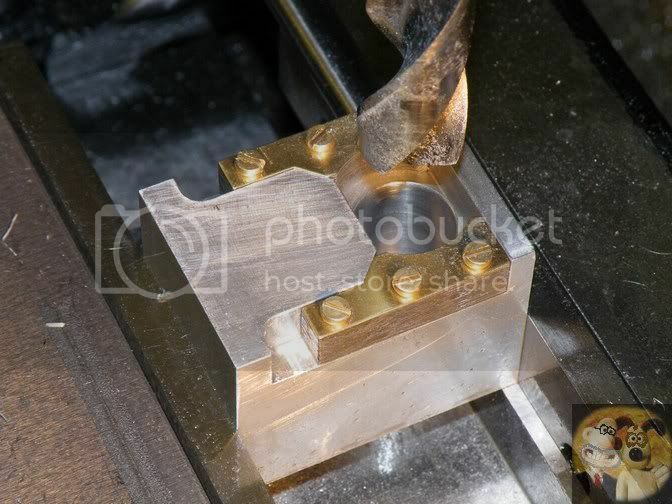 Before going any further with cutting, the bar is removed and deburred straight away and the vice given a good clean down. The now cleaned up #1 face is now put against the fixed jaw and #2 face sitting at the top, and again only gently resting on paras. 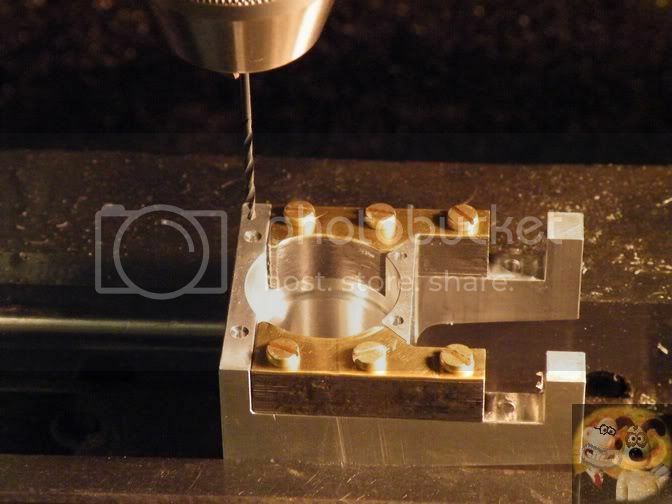 Between the movable jaws and the job, you put in a piece of soft round bar to take up any irregularities. The bar in this shot could have been a little lower, say half way between the para top and the top of the jaw, that will give a more even pressure onto the #1 face against the fixed jaw. The #2 face is then smoothed off, ensuring you end up with a nice sharp corner with #1 face. 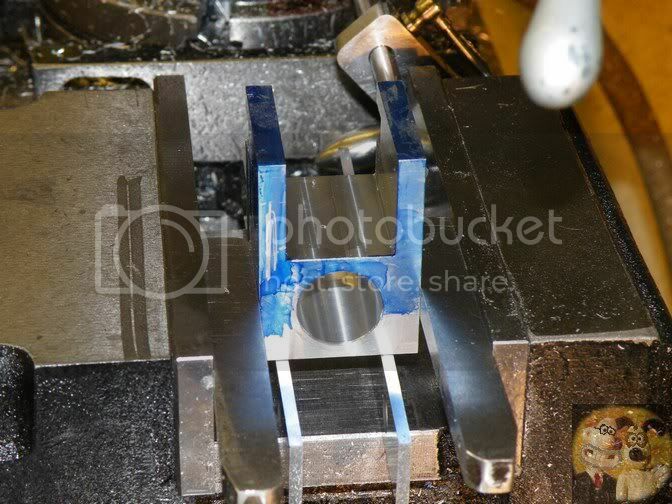 After the cleanup and deburr, #1 goes against the fixed jaw, #2 goes down onto the paras and the soft bar is put into position and the vice tightened. Now you can tap the job down onto the paras. NOT belting it down, but a very gentle tap with a soft hammer. I use a lead hammer, but hold it by the head rather than the handle, that way I am not continually bouncing the job off the paras by hitting it too hard. If you are lucky, and have the first two faces square to each other, both paras should be gently trapped under the job. This puts #3 at the top, and again that is flatted off. For the last side, the soft bar is no longer needed. Because #'s 2 & 3 are parallel to each other and both square to #1, then #1 is tapped down onto the paras. #4 is now skimmed down to give the correct dimension on the job. If extreme care is taken, and at the end only tiny cuts, you can get rather close to perfect dimension, this is about 2/10ths of a thou out. Close enough for me. Then it is just a matter of bringing the other pair down to dimension, in this case, spot on. Now comes the little matter of getting the ends square to the other four faces. 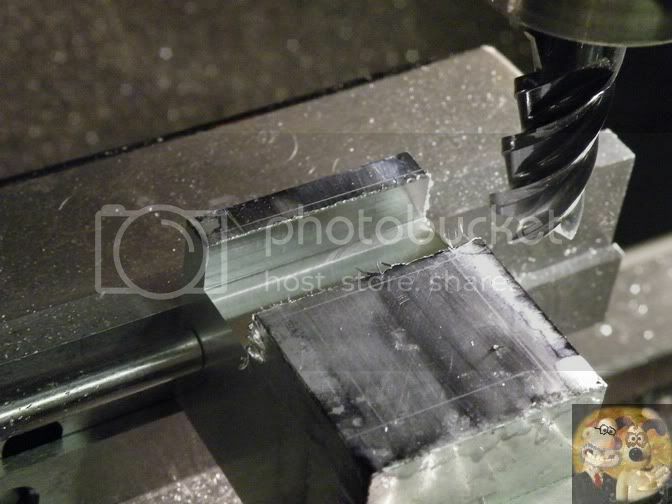 If you have an end mill that will cover the whole depth then you can just set the bar onto paras, with the end sticking out of the jaws and then just face it off. 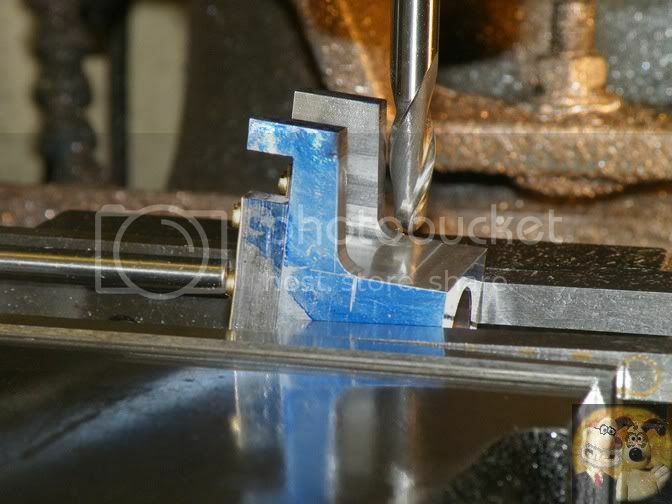 In this case, I stood the bar on end with it overhanging the vice jaws. By shining a light onto the background, you can see how far out of square it is. By gently tapping the correct way, you can get it sitting perfectly upright. It looks like it isn't quite there at the bottom, but it is, what you are seeing is stray light shining on the corner of the block. 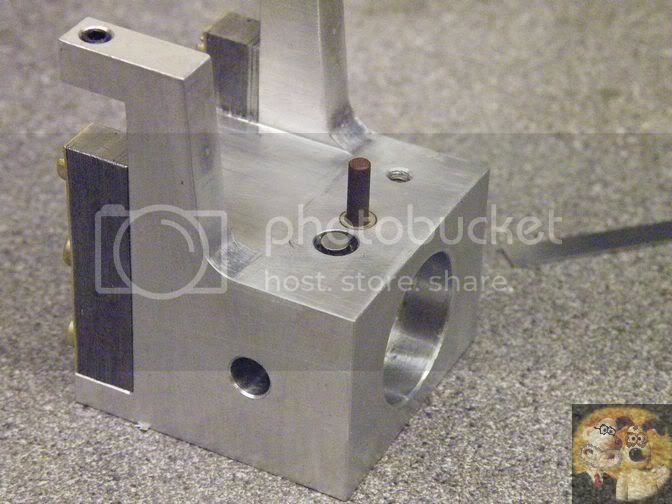 Make sure the vice is tightened up fairly well, but not enough to do damage to the part. Then a very gentle skim over the top until all the rough sawcut marks are gone. All that is done now is the face just cut is sat down onto paras and the opposite end is brought down to final length. This block took me nearly 1.5 hours to get cleaned up and down to size, but we are not in a production environment where time is money, so I don't worry about how much time it takes. 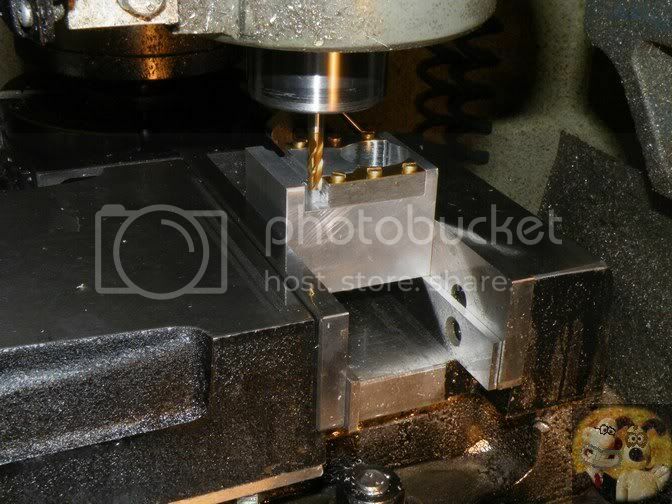 All I am interested in, is that when I come to machine this block up, because it is well finished, I won't have any troubles getting everything else to be in their correct positions. So the next thing will be, hacking this lump down to about half it's weight. I'm following along with you on this with great interest. Would you consider re posting your build of the tramming tool in the future John? It is time to start to cut bits out of the big ali lump. Before I go into detail. 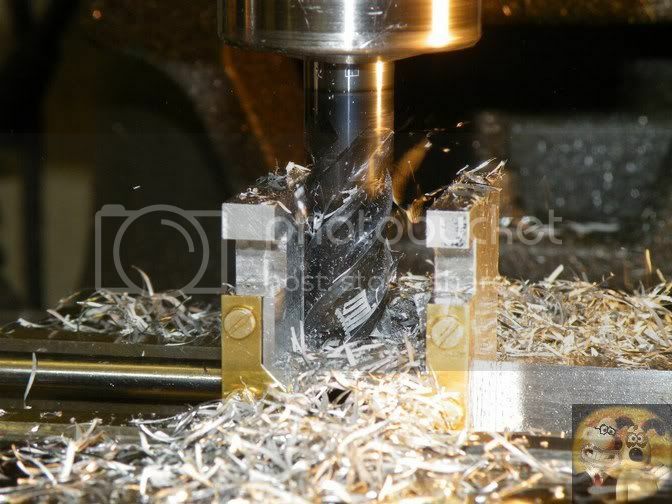 Whenever I am cutting using a normal cutter, I very rarely attempt to do climb milling, sticking with conventional milling instead. My machine (and most small manual mills as well) isn't geared up with the correct anti backlash leadscrews to ensure it can be done safely, so I stay well clear of it normally. Usually, I would give links to show what is meant, but I am not this time, as this needs to be drummed into you. There are plenty of descriptions about the difference between the two on the web, so if you are unsure about what I mean, then I would suggest you search, read and inwardly digest, to a point of where you think about it in your sleep. It could save your life one day, and besides, by you having to do your own search, you will remember it all the better. This is one set of rules you should NEVER forget. 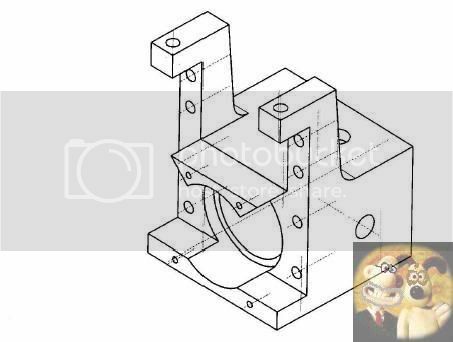 On the build instructions, it says use the left hand top corner of the fixed jaw to set your basic 0,0 datum to. Unfortunately, I don't want to do that, purely because my vice doesn't support on the bottom of the job all the way to the outside of the jaw, on the KURT type, no problems on that score. 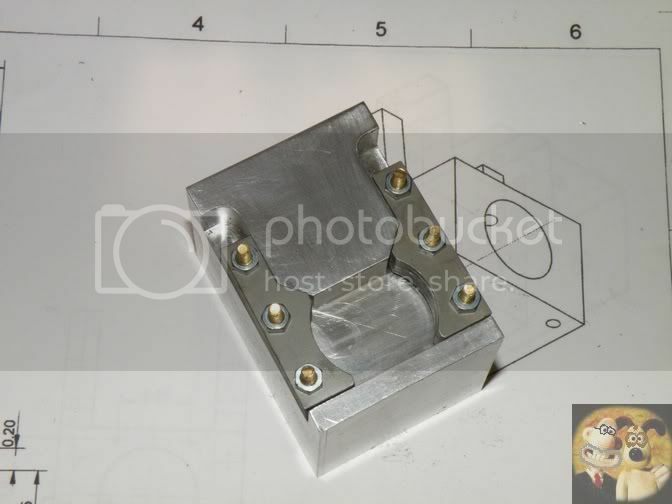 So I will be moving my datum in towards the vice centre, and use my very rigid vice end stop as a substitute for the end of the jaw instead. 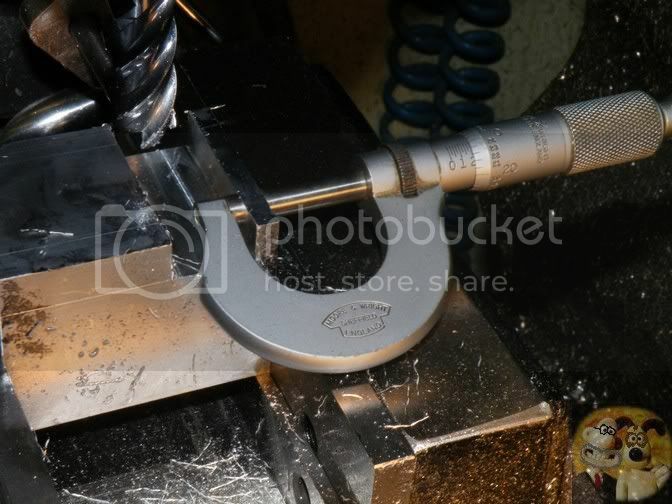 This is my setup, and it was an easy job with my edge finder to set up my datum corner. I will just point out that the instructions do point to using a DRO for coordinate machining, but in my view, this magneto could easily be built plenty well enough by good layout and cutting to split the line. In fact, even though I do have a DRO system, I still do a basic layout on a job such as this, purely as a double check as I am cutting. Job mounted, pushed up to the backstop and gently tapped down onto paras, and the first cut on it's way. 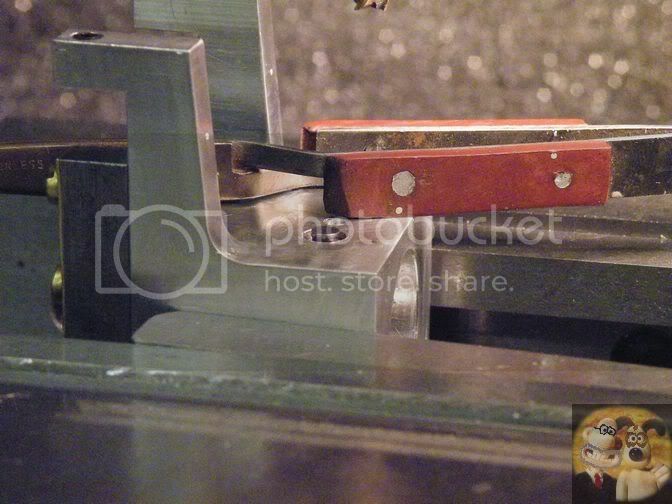 On wide slots, or on any slot at all that needs to be accurate, I never use the correct width cutter to begin with. 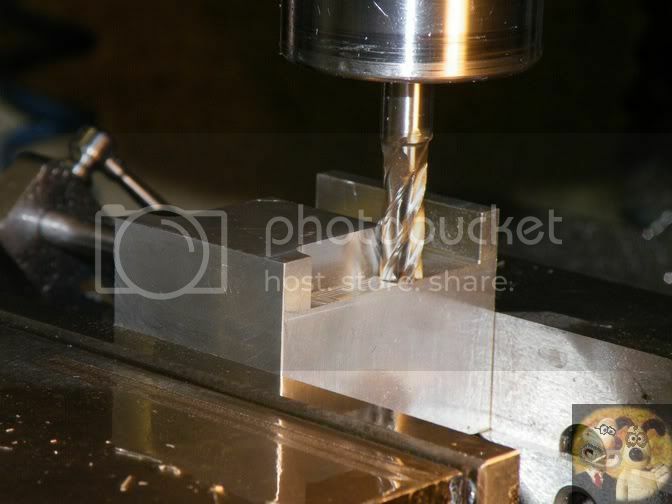 You will find that the cutter is usually flexed by the cutting forces involved, and will cut an oversized slot. 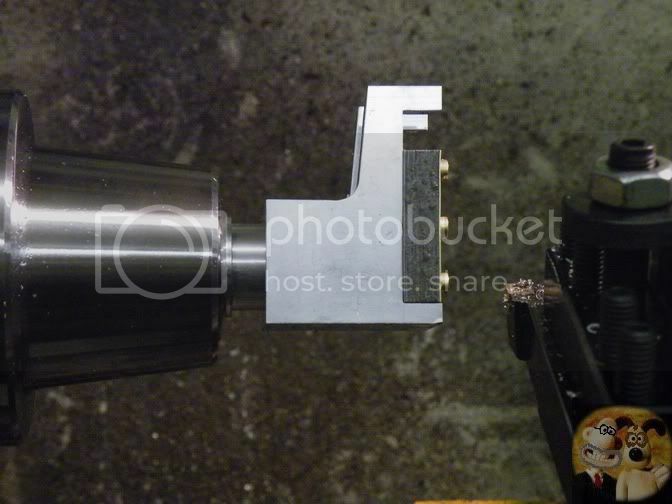 So in this case, a 16mm cutter run straight down the middle of where the slot is to be. 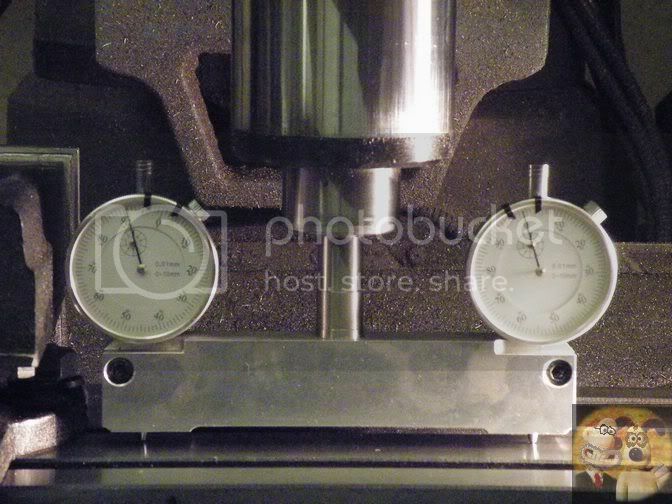 It was taken down in stages until it was shy of full depth by 0.005". This is to allow a cleanup cut to be done at the very end. Then I just gently crept sidewards to each marked line in turn. As you get very close to the line, there are plenty of ways to measure to ensure you end up in the right place. 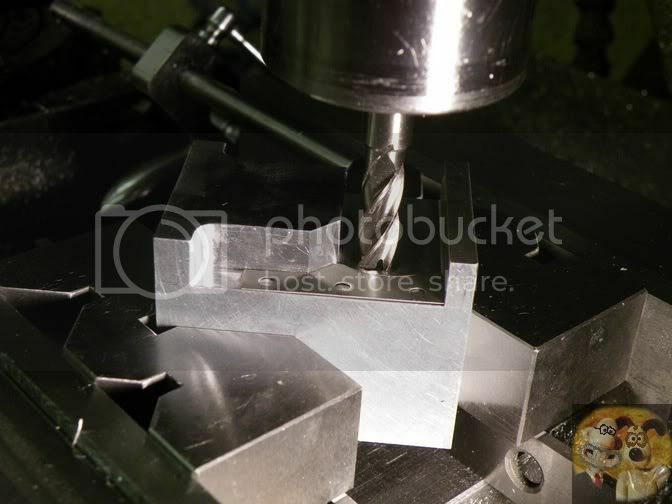 On the finishing cut to the line, the tool was dropped to it's final depth and the cut was taken. The tool was then retracted up by 5 thou and the second line approached in the same manner. Big slot in the right position, and to good size. 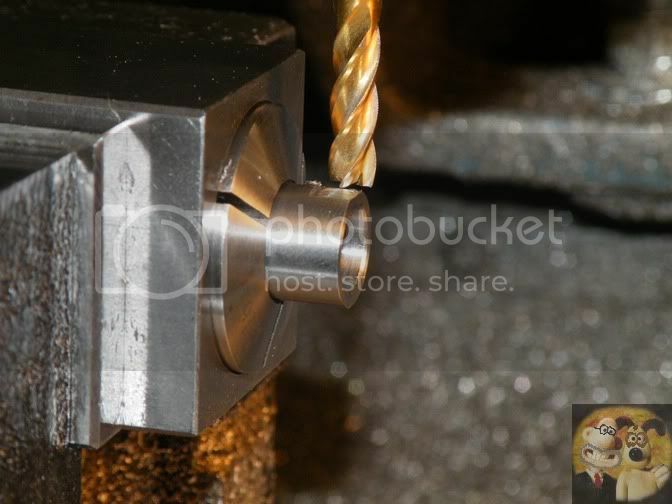 You then have to chew away at the two sides with the recommended 5/16" end mill. No problems in doing this, and it is at the same depth as the previous slot. Except in my case, the marking fluid I used was washed away by the WD40 I use for cutting lube, and because my scribe lines were so feint, I overcut the length of the first slot by about 10 thou. But no problems, it isn't in a critical area and I just made the second one the same length, just to match it up. This is what you should end up with, minus ten thou on the rounded end. 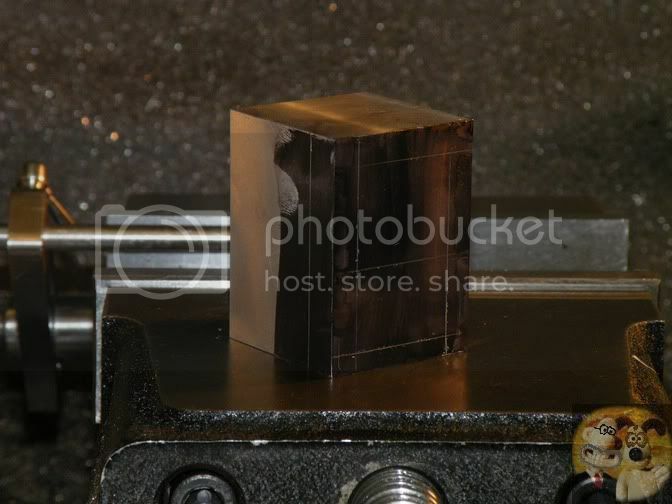 The next bit is to lay a lamination against the slots just cut, and mark the 45 deg angled face onto the block. This is only a guide line, you fine tune as you cut it. This bit had me perplexed for about thirty seconds. 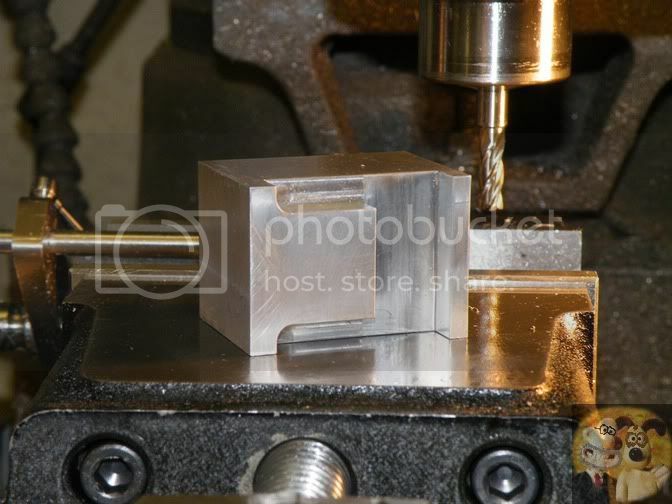 The instructions suggest swivelling your vice by 45 degs either way to be able to machine to the lines. But as most people do, my swivelling base is languishing in the back of my shop somewhere, never to be seen again. So I came up with this, a pair of V blocks, with both the blocks and the job being supported by the parallels. 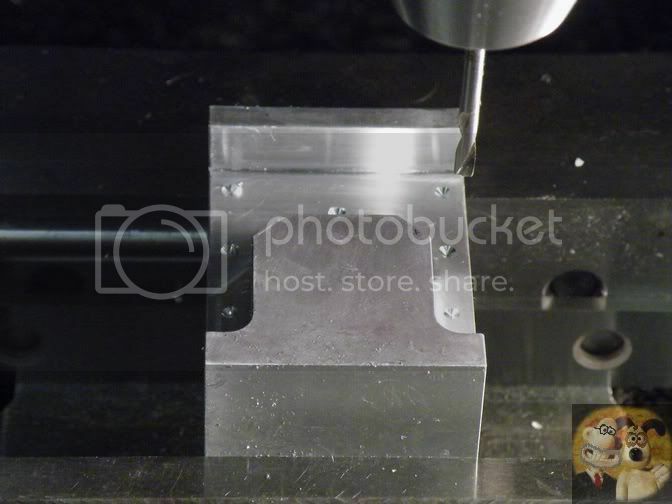 The cutter was already at the right depth, so it was just a matter of cutting the first one in the Y axis, and the second using the X axis. Just like this, sneaking up on the angle so that the lam sits perfectly against all faces. This is where the lamstacks will eventually be located. That is a job for next time. This is mainly about holes, both little and large. I just hope it doesn't end up being a boring post. 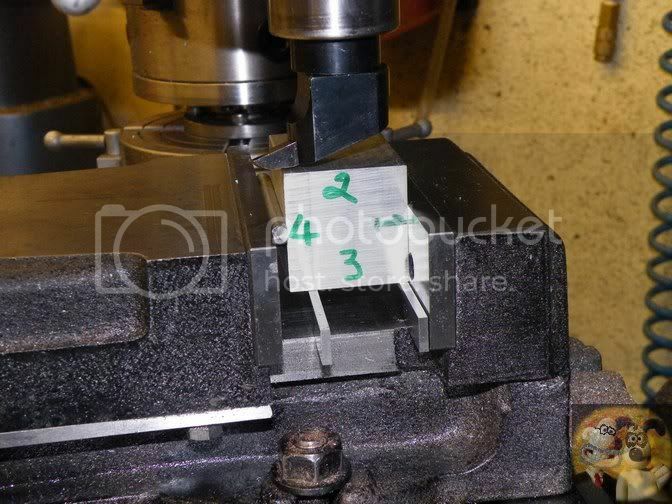 As I have been tapping and tinkering around the mill vice for a few days, on start up, I double checked that my 0,0 datum hadn't moved. No worries, it was still exactly where I left it. On the very detailed build instructions, it says that you can either spot thru the lamstacks to mark their mounting positions, or use co-ordinated drilling. It is difficult for me to hold and hit at the same time and still keep it accurate, so I have opted for the electronic DRO route. I did a bit of measuring of one of the lams and got my first datum point, then I could just use all the drawing dimensions. This is my working out. Using my figures, I spot drilled all the points, plus one in the middle, I will tell you about that in a couple of minutes. You might notice that I said spot drill rather than centre drill. Ever since these drills have dropped in price dramatically, I haven't used centre drills since, they are just too inaccurate and very prone to breakage. For those in the UK, this is where I get them from. About the cheapest you will find anywhere. After spotting, I followed them up with a 2.5mm drill to a depth of 8mm, all except the odd one out. Time for a bit of an assembly job. 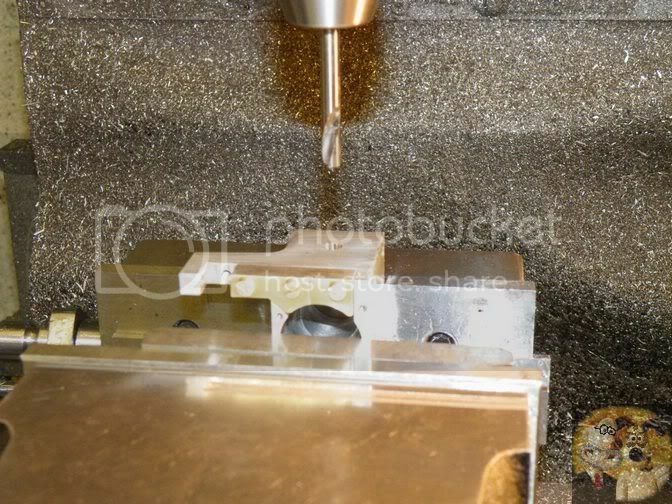 You will find throughout this block machining exercise, you will add a bit more to allow you to machine a bit more. So the holes were hand tapped out to 3mm and the bits were got ready to fit. I would make a suggestion to do what I did, that is to clean down the lamstack holes, very gently, with a 3mm drill. Some of the glue had wicked it's way down to the hole area, and when I came to screw the screws back in, they were so tight, the lamstack started to split apart. So I stuck them up again, let 'em dry a bit, did the drill thingy and screwed them onto the block. I had to add an extra lam to each side so that the brass lam sat flush with the surface. Spare lams are supplied for doing this very thing. It looks like my drilling was OK.
At this stage the instructions suggest you mount the block into a 4 jaw on the lathe to do the boring. 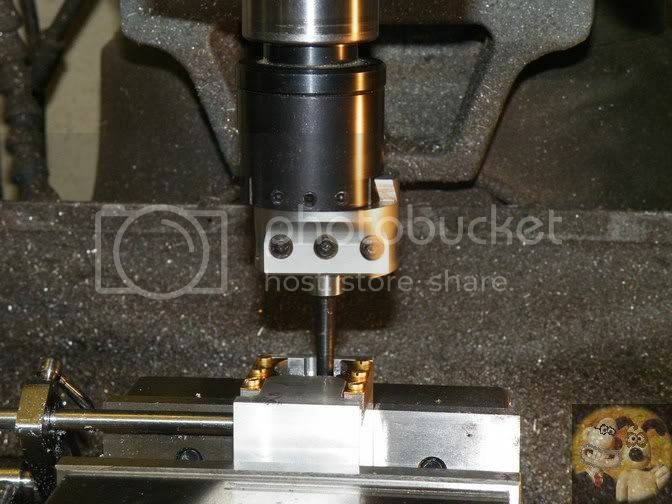 Unfortunately, that is very difficult for me to set up, and I find it much easier doing it on my mill. 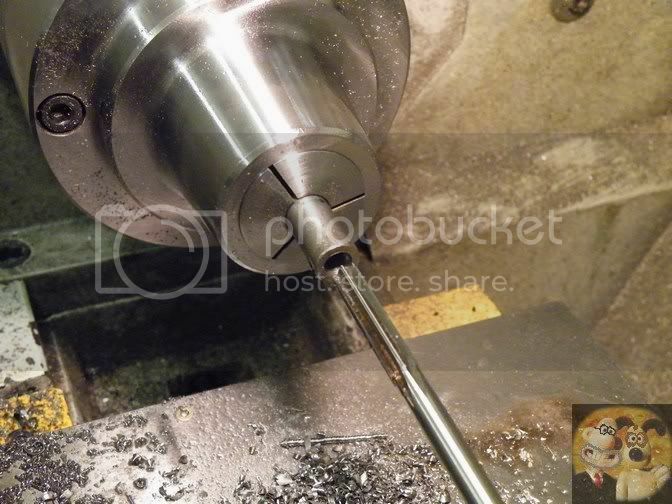 So you will have to imagine that what I am doing is on the lathe. 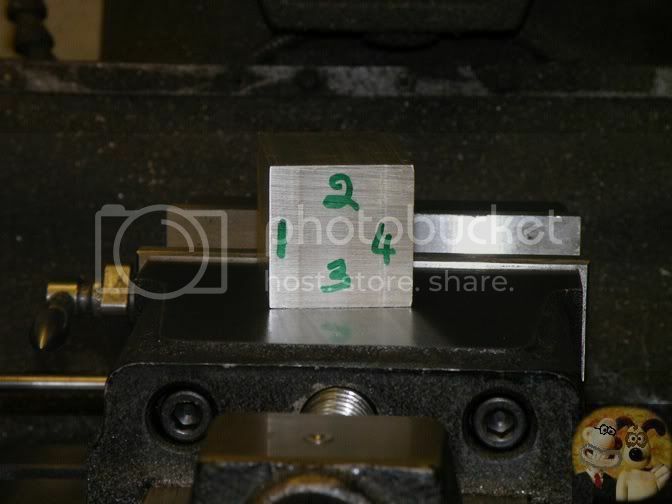 The spot drill point was refound by following the coordinates in the 'structions, and using a series of drills, I opened the hole up to the recommended 3/4". If you don't have drills of this sort of size, I would suggest you use the biggest you have, and start your boring from there. 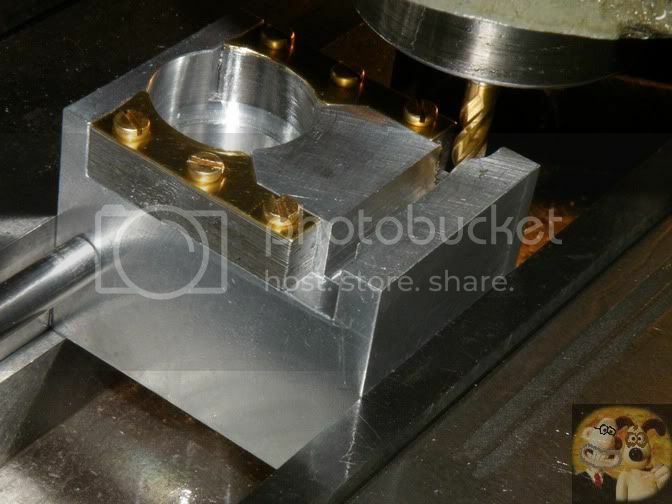 Using my imperial boring head, the block was opened out to two distinct sizes, all very precise info is given in the build book, one all the way through, then the other to form a recess. 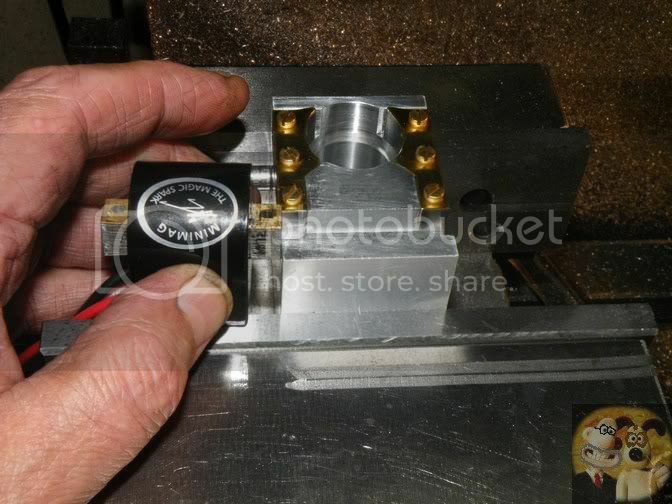 The one all the way thru is to take the pair of bearings, and the recessed one for the rotor. You will notice that the boring operation has cleaned up the inside faces of the lamstacks. So yet again, the block was put back to it's datum place. 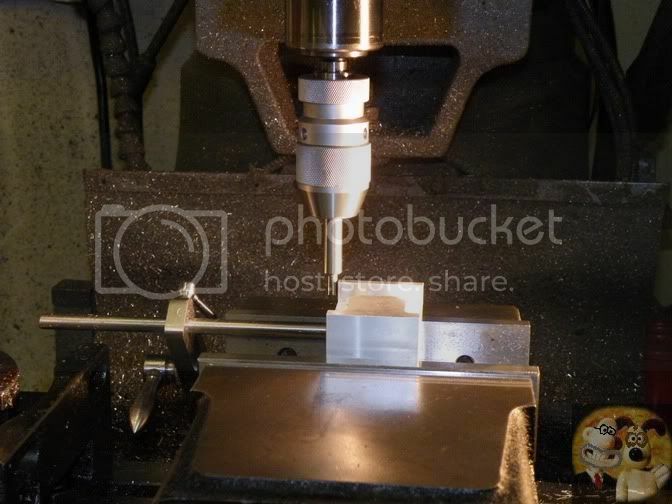 This next stage takes you part way to fitting another bit, and also, why I wasn't worried when I overan the stack slot on the initial machining. I am using a 5mm el cheapo Chinese end mill here, if it will do the job, why pay megabucks when you can get them for pennies. Using the same technique as I used on the first large slot, a beginning slot was cut down to just shy of full depth, somewhere near the middle of where the slot needs to be. I will be creeping towards the top area of the lams, and when I get there, put the cut to full depth and take a skimming cut across the top of the lams, just to clean them up. Now I needed to concentrate on getting the slot to a very snug fit around the lams in the coil. Measuring both sides up, they were the same size, but very slightly tapered back to front, larger at the front, perfect. Get close, then using 1 thou cuts, gently open up the slot. This is what I ended up with, the coil lams pushed fairly easily into the slot for the first 3/4 of the depth. When the holes are drilled and tapped, the screws will pull it in and form a perfect friction joint between coil and the two side lamstacks. If they are too tight, a quickie swipe with a file will put it right, but that will be a bit later. The coil bit has to be left now, while the cutouts in the block for the coil to fit into are done. That is the next job. This block seems to have taken an age to get to this stage, but what you must remember, I am now a very slow machinist and builder, so most reasonably experienced people could do this whole block easily in a full working day, if you have things organised. This stage is now to get the block into the correct shape to accept the coil, which is sitting on top. If you look very closely, you can just see the layout lines for the required cutout. 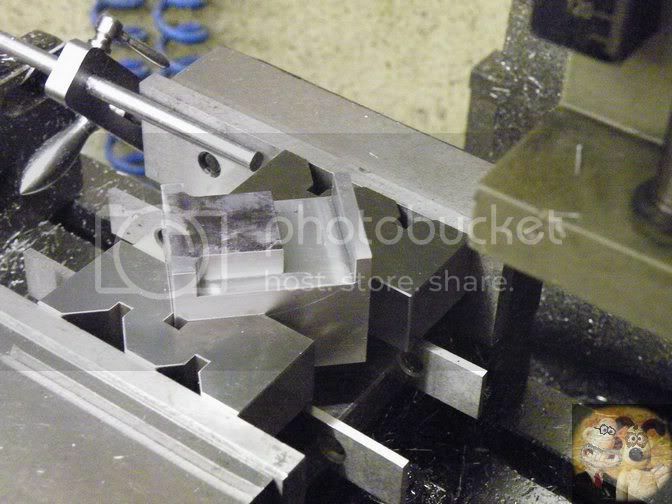 The usual thing, straight down the middle with a big cutter, not quite to the bottom of the required slot, then go to each side in turn. Just reaching the second side. This next bit is the final shaping of the block. The level bit is done first, then the angle. Because the lamstacks were not quite flush or below the side faces, I used an extra set of paras, one either side, but not as far forwards as the lams, So allowing the block to be held rigidly. The horizontal cut was then taken to depth and the correct distance in. 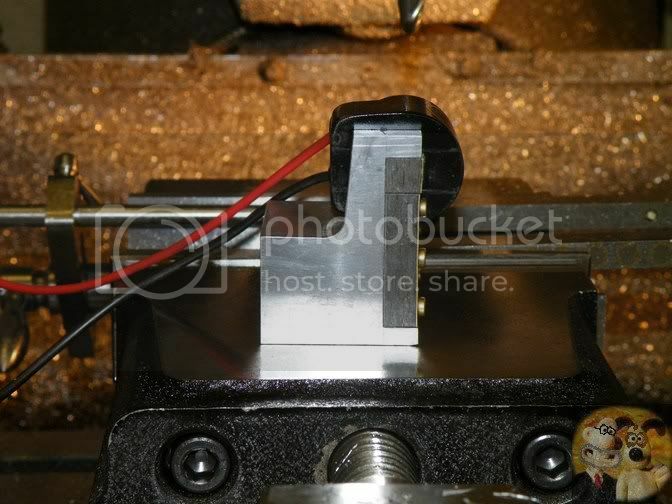 Again, because I don't have a swivel base on my vice, I can't do the cuts as shown in the instructions. Because this angle isn't super critical to the build, I continued to hold the block as before, with 4 paras, but eyeballed the angle and made sure that the bottom corner of the block was resting on both lower parallels. 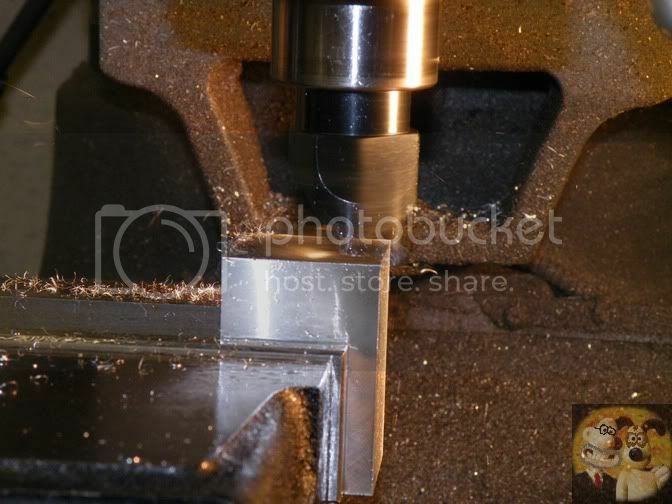 Using a 10mm ball nosed cutter I cut up to the line by about 2/3rds down from the top. Then once the line was reached, I continued cutting straight down until it was almost at the horizontal face. 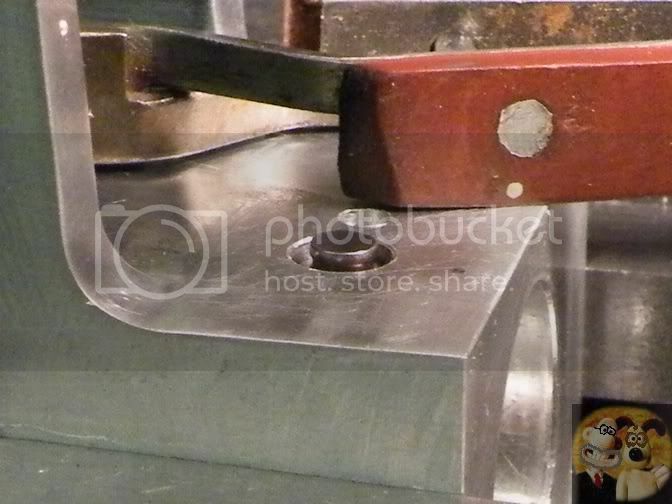 Once it was taken out of the vice, I blended the radius in to the horizontal face with a round file and a bit of emery cloth. That is all the cutting that is needed. As can be seen from this side shot, the coil can now fit where it should. And another shot from the front. The holes in the coil were then spotted thru so that the holding screw holes can be drilled and tapped. 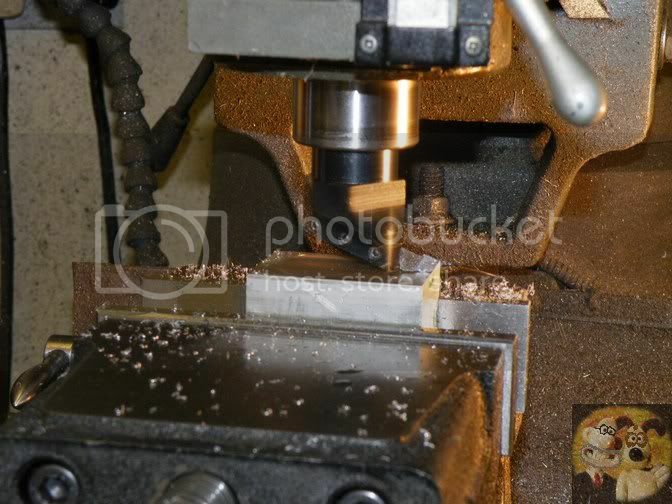 Even though the block is to shape, lots of holes need to be drilled. Their positions are all shown on the plans. These holes thru the 'ears' are for a couple of grub screws, that if you haven't got quite a tight fit of the coil lams to the side lams, the coil lams can be forced down so good contact between the two is made. Because I am a belt and braces person, even though I have good contact between them, I am going to use these as well. 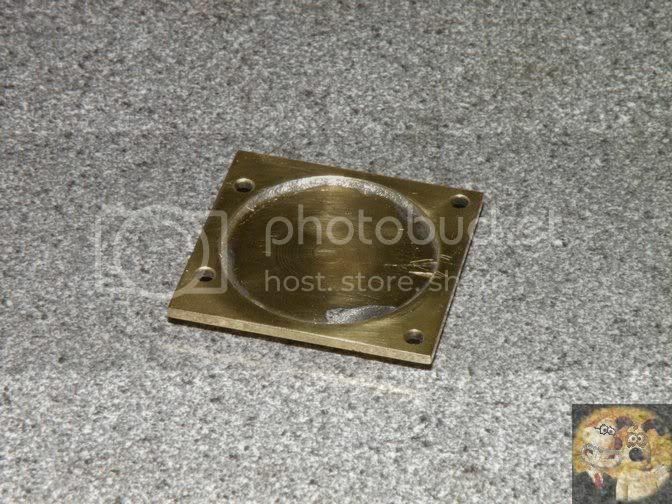 The next job was to pick up the two spotted marks and drill the holding bolt holes to depth. These four 2mm tapped holes are for a cover plate to fit over the rotor. 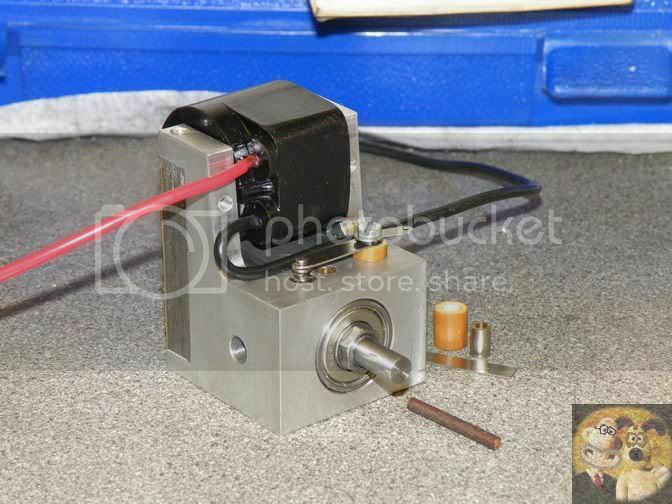 This is optional, but I think it is a necessity, purely to stop bits sticking to the magnets in the rotor. 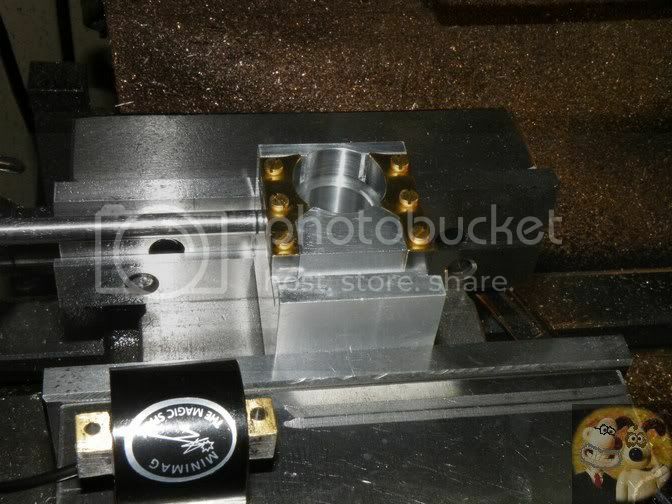 Then finally, the four magneto mounting screw holes. 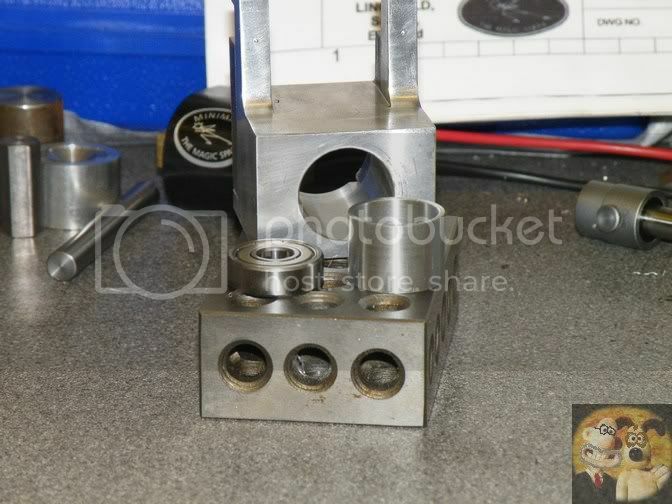 All the holes were tapped to their correct sizes, and the coil checked for fit. This block isn't quite finished with yet. It needs some bits making on the lathe and fitting, then the few remaining holes can be drilled. 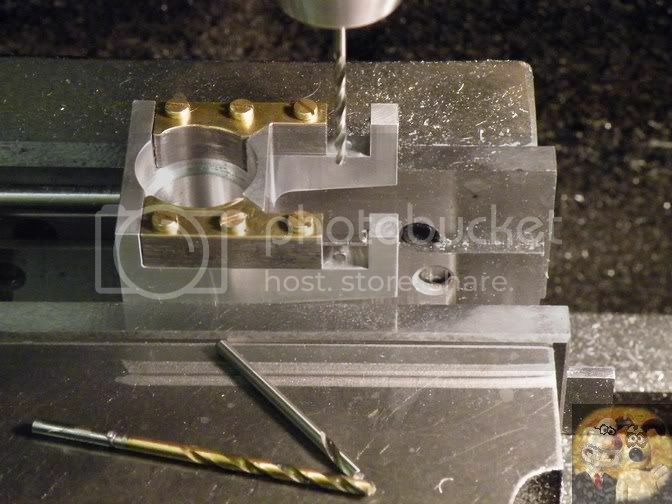 But other than that, this is that very complicated looking bit finished, just by carrying out some relatively simple machining exercises, done in a logical order. Onto the lathe next time. Just a little bit this time, but still progress. I will just make a point about a couple of things. 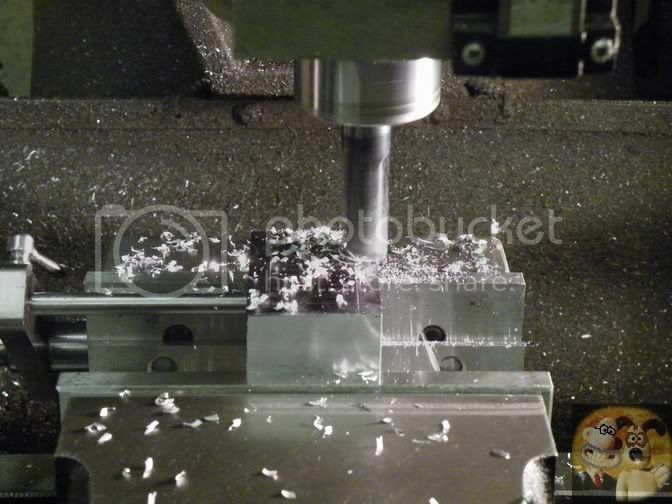 The materials that have been supplied in the kit have been spot on for the job they have to do, and up to now they have machined beautifully, especially the aluminium, no tears, rips or picking up. It has been a joy to use. The second concerns accuracy. 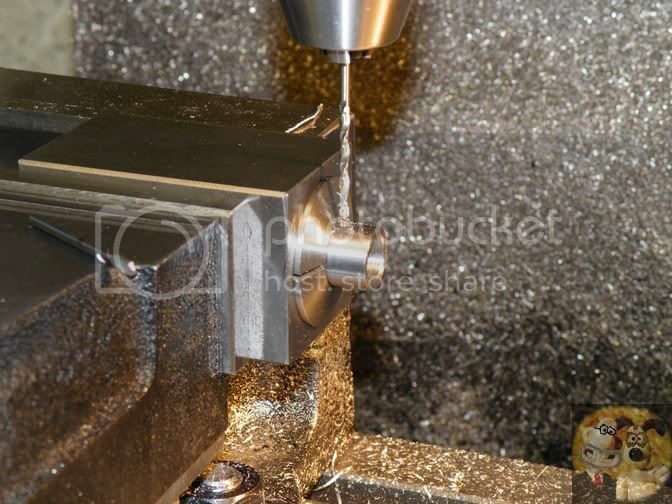 For some of the parts made in the lathe, good accuracy IS required between certain ones, otherwise things will lock up or not, depending on what is required. 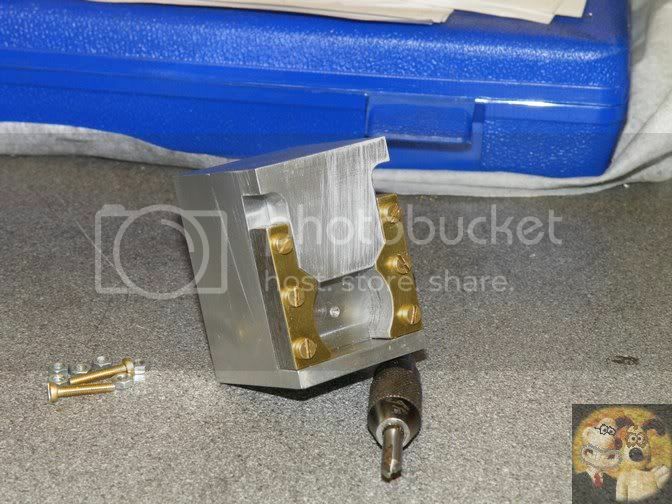 This is especially critical on lengths of parts. So allow extra time just to make sure that things are really spot on. 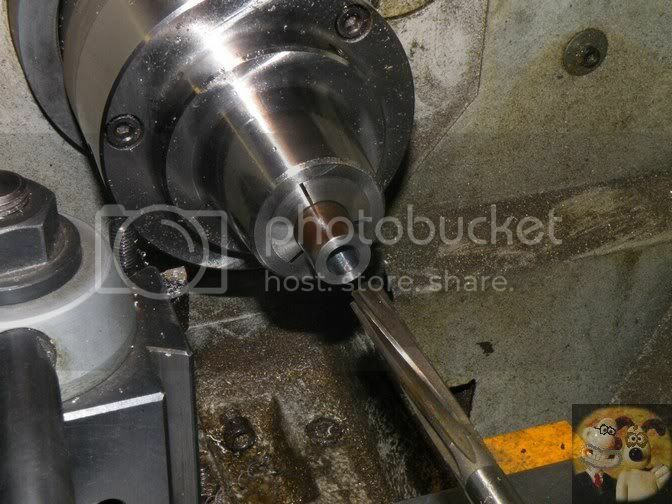 I am now starting to do the lathe work, which concerns mainly the spindle, points operating cam and bearing fitment. 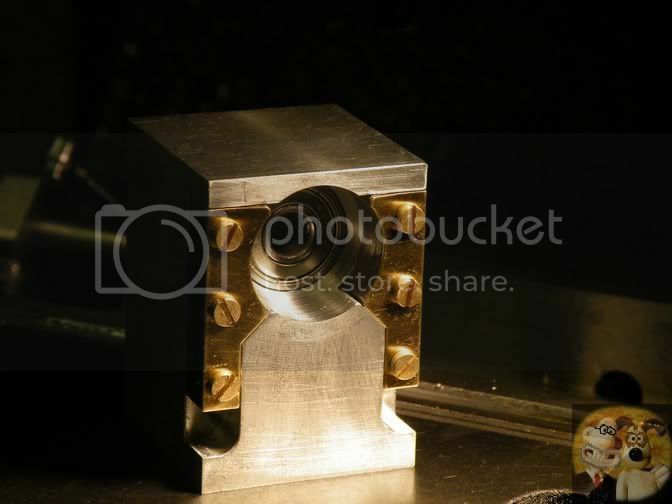 The first piece called for is a spacer to go between the two spindle support bearings. The instructions called for opening up the centre hole to a certain size with a drill and that is the job done. Unfortunately, I can't be like that, so I opened it up to one size smaller and finished it off to shown size with a boring bar. 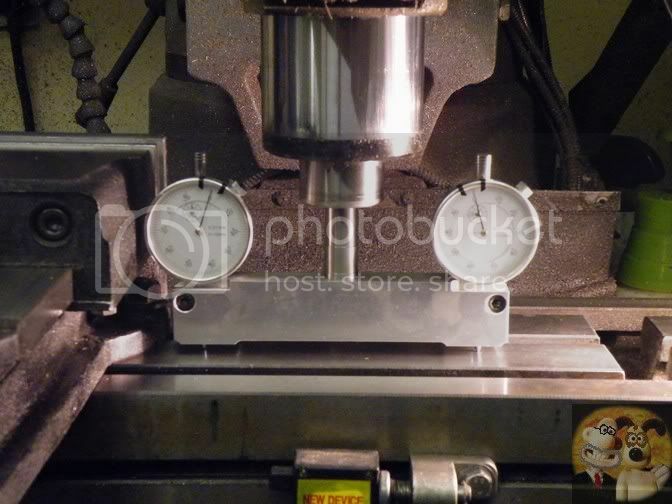 It only takes a few minutes longer, and the surface finish is much better. The outside size was turned down until it fitted into the thru hole with a nice sliding fit, not too tight as Loctite will be used, and that requires a bit of space to work in. The spacer was parted off and brought to exact length. 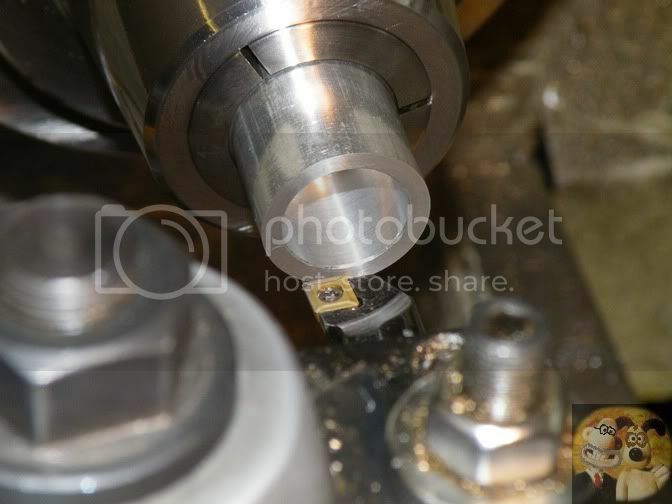 The spacer needs to be fitted from the front face exactly the width of the bearing. So what I did, was to put the block face down with the bearing pushed all the way to the bottom of the thru hole and the back end of where the bearing sat was marked up with a felt tip. The front bearing remains free to be taken out, so I had to ensure that no Loctite could get to it. 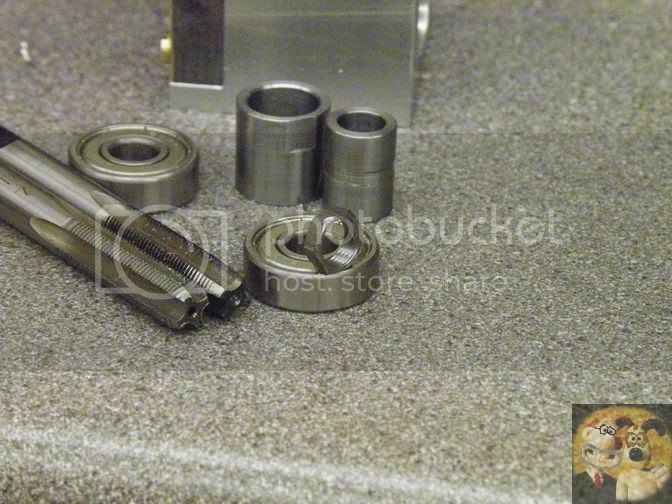 By putting the drops of Loctite further in from this mark and assembling from this front side, the bearing will be safe. The spacer was put in first, followed by the bearing, but not fully inserted. By pushing from the back of the mag block until the front hit the 321 block ensured that the bearing and spacer were in their correct positions, with the bearing flush with the front face. Another 321 was pushed up to the back face to keep things steady until the Loctite had done it's work, in this case, 5 minutes. Next came the cam, very easy to make, but this is one component that does need to be made the correct length for it to adjust correctly. 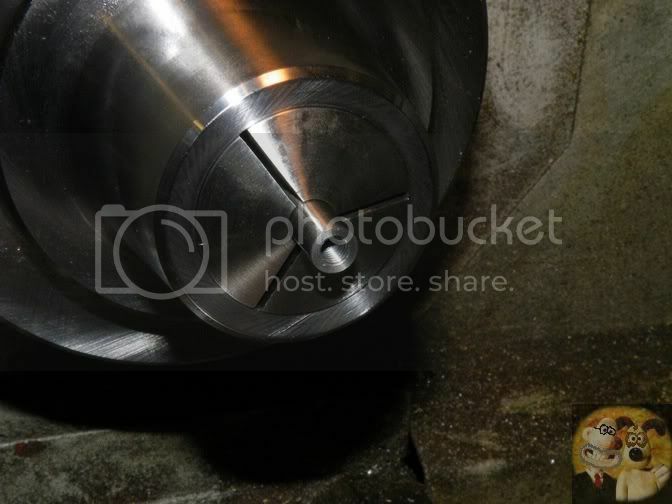 The centre was first drilled then opened up with a 12mm reamer. The outside was brought to size, then parted off and brought to length. 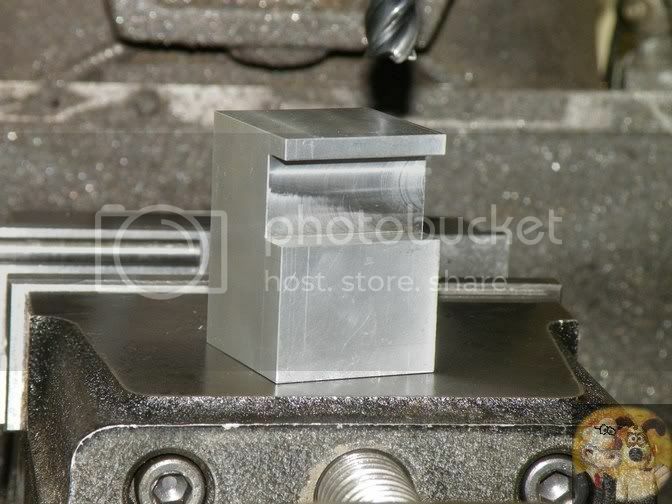 The cam blank was then tranferred to the mill using a square 5C collet block, and the flat face put onto the outside. There are lots of simple other ways that this could be done, so no worry on that score. 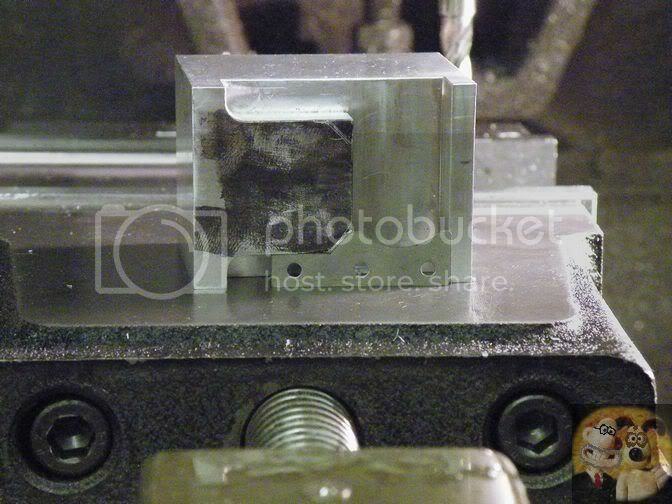 The block was then rotated 90 degs and the hole for the retaining grub screw drilled in the correct position. It was then transferred back to the lathe to have the outside polished a bit and the flat blended a little into the side curves. 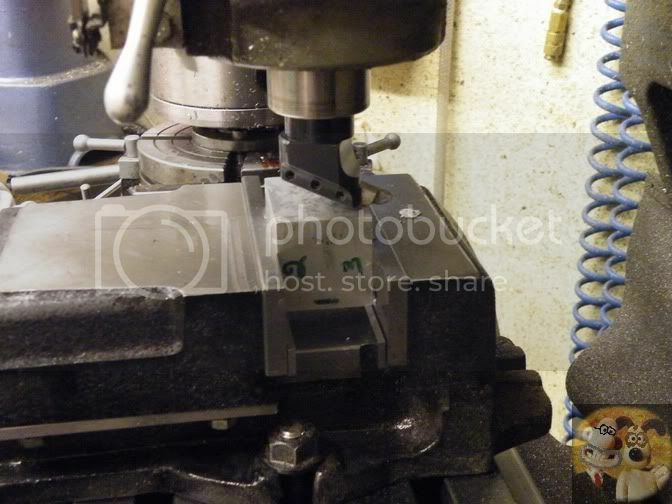 Once the grub screw hole was tapped out, the cam was finished. The instructions suggest that if you wanted to, you could case harden it. I will make that decision when I have made all the parts. A bit more lathe work to follow. This is really nice John. I could make good use of this kit once it comes on the market. Any idea about its suitability for multi-cylinder engines? Would there be a limit on how many cylinders it could handle? Most of what you can do with a magneto stems from how you actually drive it. To put it into layman's terms, the faster you have it running, the more sparks it will produce. 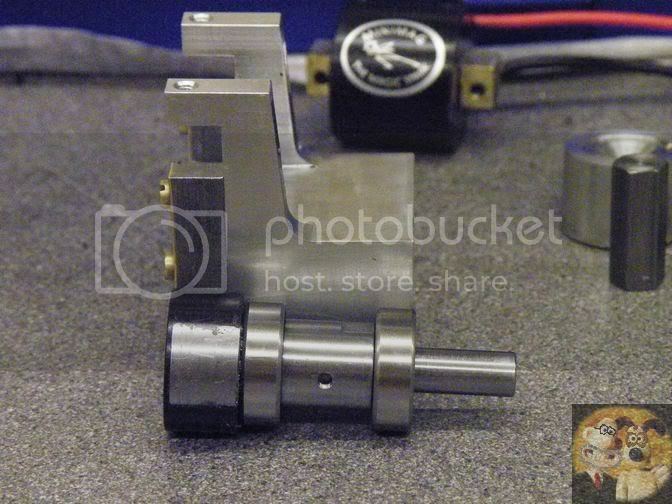 I will be using it on a single cylinder four stroke engine of approximately 120cc, but driving it at crank speed, rather than at camshaft speed (1/2 of crank speed), that means I will be using a 'lost spark' system, where it delivers two sparks during each four stroke cycle, so that means with the setup I will be using, it could be used to drive a two cylinder four stroke engine, as long as the firing timing for each cylinder was 180 degrees apart. If a distributor was brought into the equation, and the magneto was driven at a higher multiples of crankshaft speed, then yes, multi cylinder engines should be able to be run off it quite easily. This little one scores over the original Jim Shelley design in that it uses more powerful magnets, and so stronger sparks. 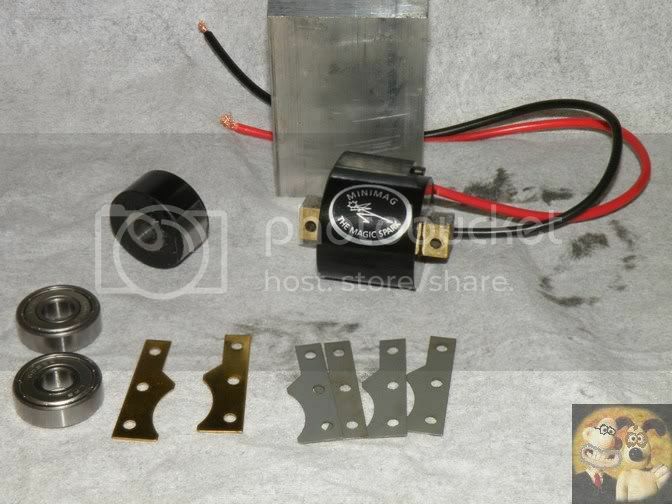 In fact, I have been given an even more powerful rotor by Julian, that might already be issued with his later kits, and I am a little undecided whether I need to fit it, as this one, as it is, will do exactly what is needed. There might be, but as I explained in the first post, making one from scratch, for just a one off, for me, wasn't an option. Too much work for little gratification. 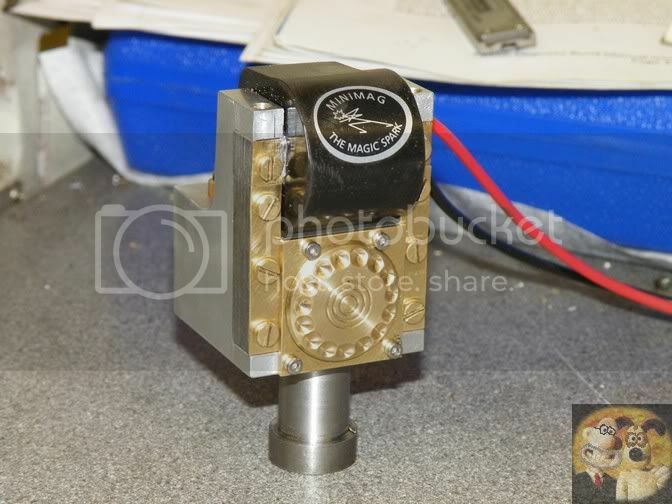 This isn't meant to be a scale replica, but a method of getting a complete ignition system 'built in' and ready to go, rather than having to have the usual system of batteries, and their charging, points etc. 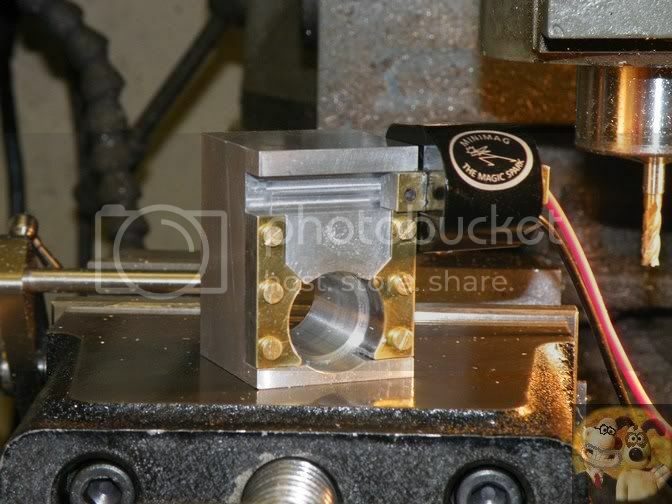 Basically, todays offering is finishing off the main lathe work that is required. A few of the finishes look rough as old boots, but in fact they are very fine indeed. I think it is something to do with the lighting. 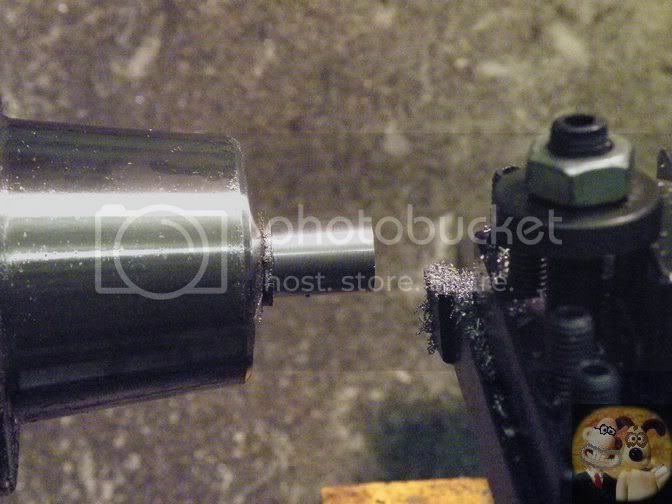 Carrying on from the last post, the spacer that sits inside the cam needs to made. The first job was to drill and ream it out to 8mm. The OD was then turned until the cam sleeve just fitted onto it with a nice sliding fit. I actually deviated from the plans with this bit. 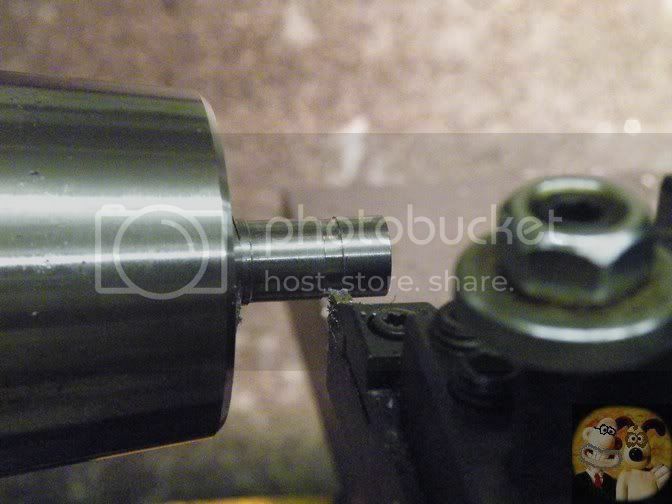 I lined up the cam sleeve with the end of the spacer and spotted thru the grub screw hole. This gave me a mark so that I could put in a small recess into the spacer. The reason. When a grub screw is tightened, unless it has a soft end, it will throw up a burr. 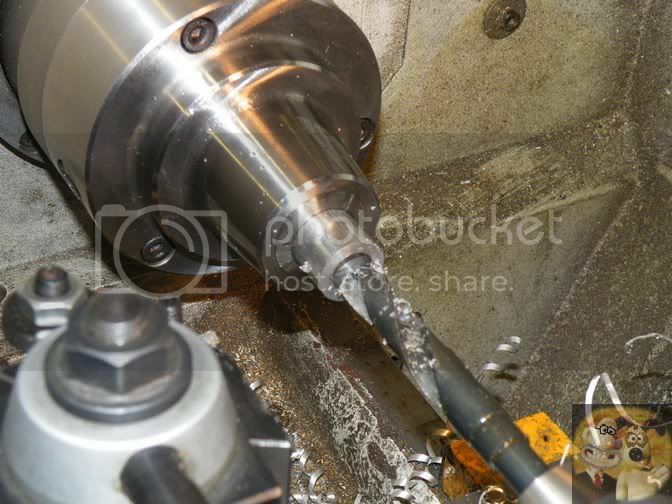 In this situation, where the cam sleeve has to rotate around the spacer, that burr will jam everything up and most probably cause problems when taking the whole shaft system apart. 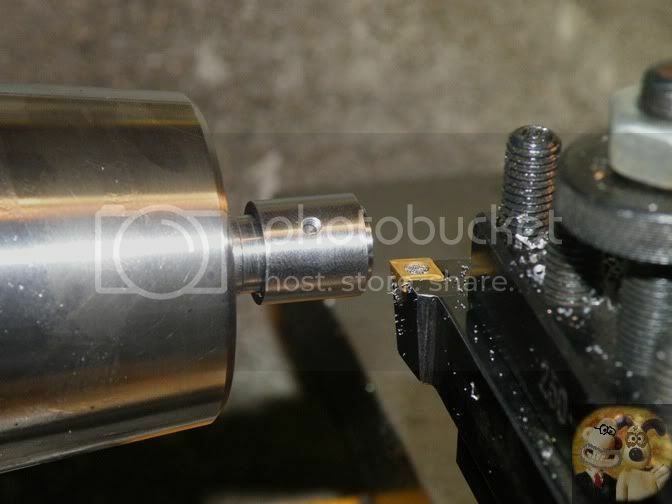 This groove will allow the burr to be below the running surfaces and so it won't cause a problem. After this groove was done, the spacer was parted off and brought down to EXACTLY the same length as the larger bearing spacer made previously. This is what it will look like when fitted inside the main block. The outer races of the bearings will be sitting against the larger spacer that is already stuck inside. So both the inner and outer races have the same length spacers between them. This is it pulled apart. The next job was to make up a 5/16" x 32 TPI ME thread half nut (sitting on top of the bearing) from the hex material supplied. 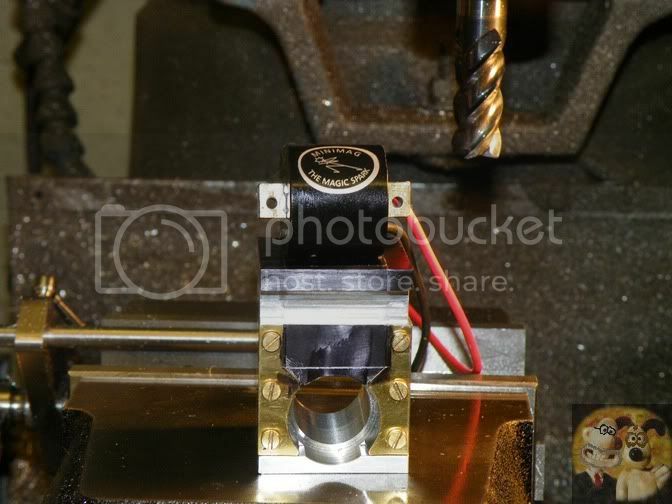 The final job of the day was to make the main 8mm diameter spindle from the ground stock that came in the kit. First it was skimmed down to plan length, followed by tapping a 5mm thread into one end. 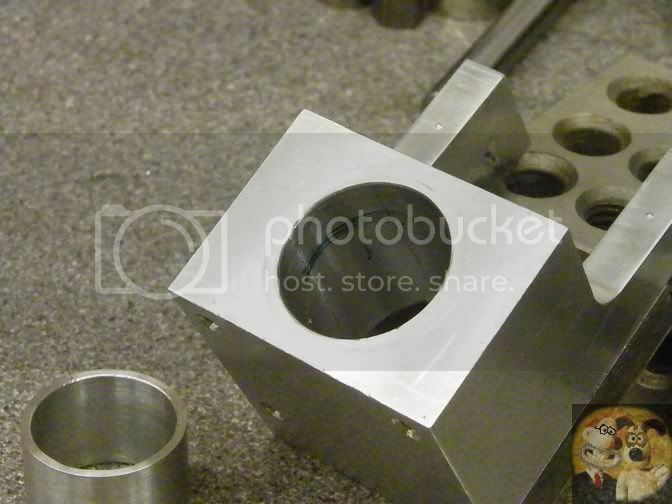 The other end was taken down to size for the projected sprocket or gear shaft and a matching thread for the nut put on, all to plan dimensions. What the finished article looks like. Actually there is nothing that was done today that should hold fears for anyone, except maybe having to single point threads if you don't have the correct taps and dies. Also a little extra care is required to make sure you get dimensions spot on, rather than near enough. 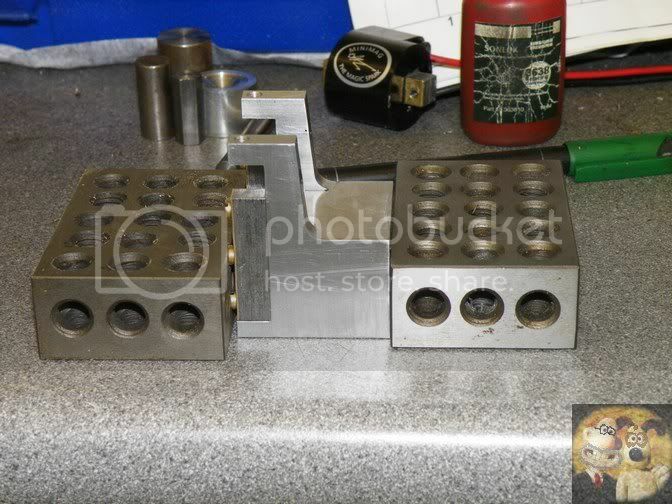 To start to bring this build to a conclusion, the main block has to go back onto my mill and have a few holes drilled, the items shown in this picture made up into the contact breaker setup and be fitted into the block. 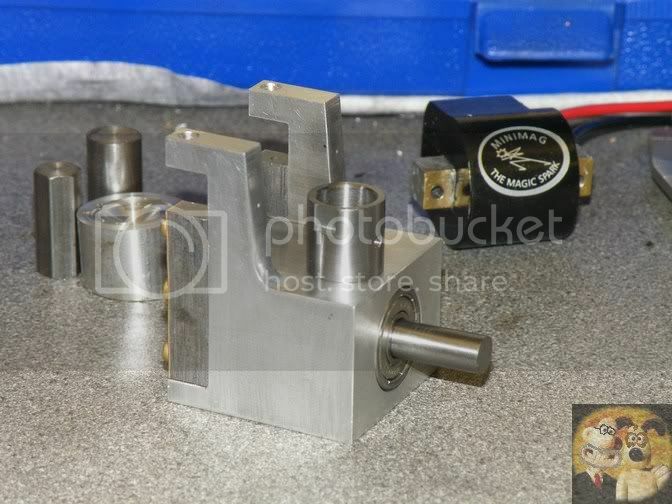 Then just a dust cover for the rotor making, and it should then be ready for final assembly. Just a few holes to drill in the main block and make the points system. 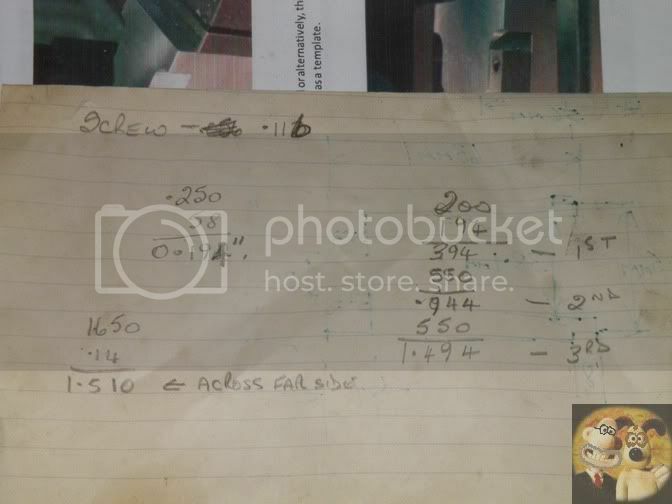 The holes are coordinate drilled from the dimensions shown on the plans and the points system is built up from the precise instructions as well, so I won't go into super detail unless someone asks about it. Three holes are drilled in the top face, but I am showing this one especially. 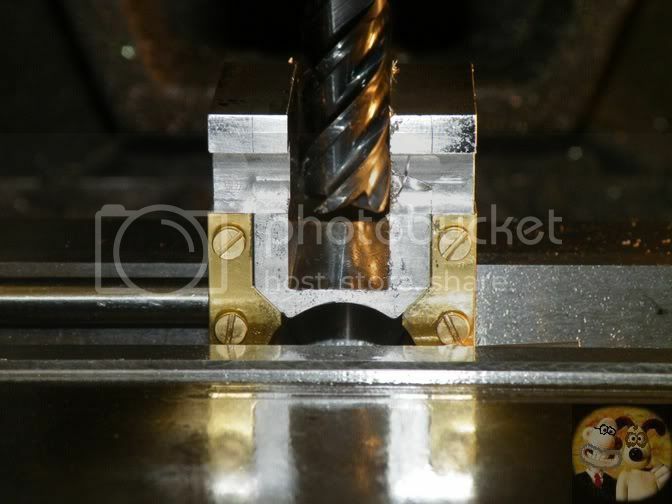 The hole requires two operations, I went down first with a 2.5mm drill to give a recess in the bottom, it can be a fair amount deeper as it is only to give clearance, and then followed it down with a 6mm end mill to the specified depth. 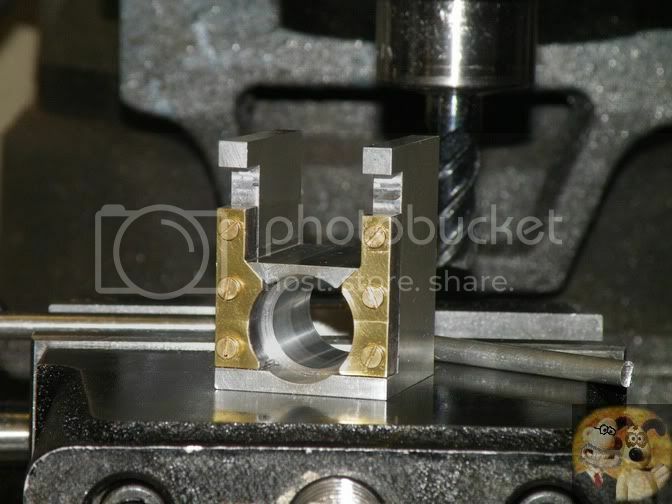 This forms the flat bottom hole that is required for correct fixing. See C-o-C below. I hope this explains what I am on about. 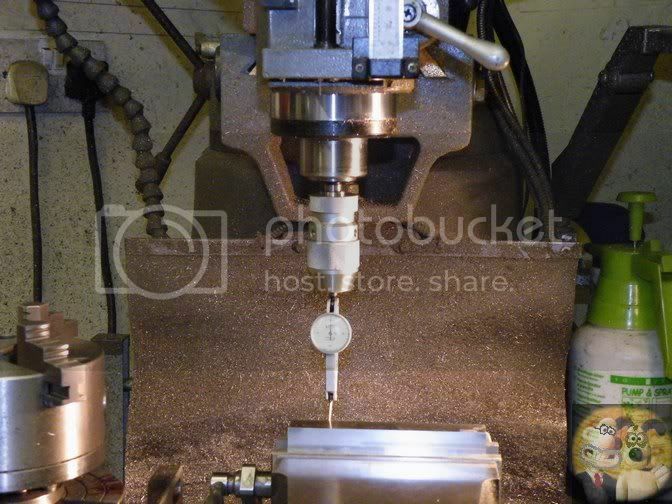 A very similar operation to fitting a bursting disc, or core plug as some people call them. 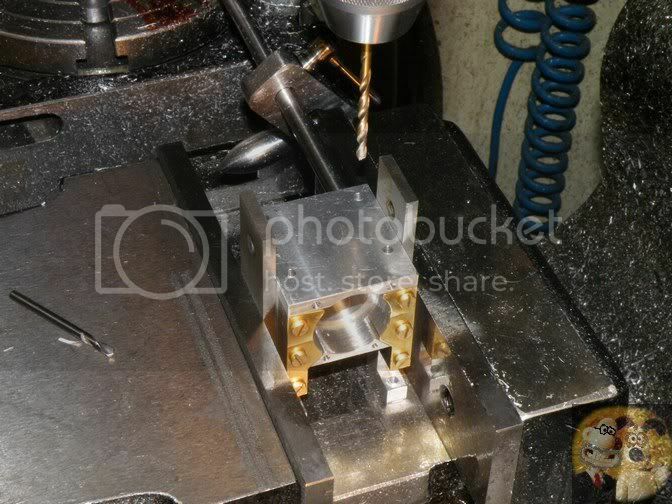 The fourth hole is drilled thru the side to allow access to the cam grub screw, to allow it to be adjusted. Be very careful to drill the correct side. I nearly did the wrong one, but luckily caught it before making the mistake. It makes adjusting rather difficult if drilled in the other side. At this stage, the screw for the main shaft was fitted and the rotor Loctited onto the shaft as far as it could go down. 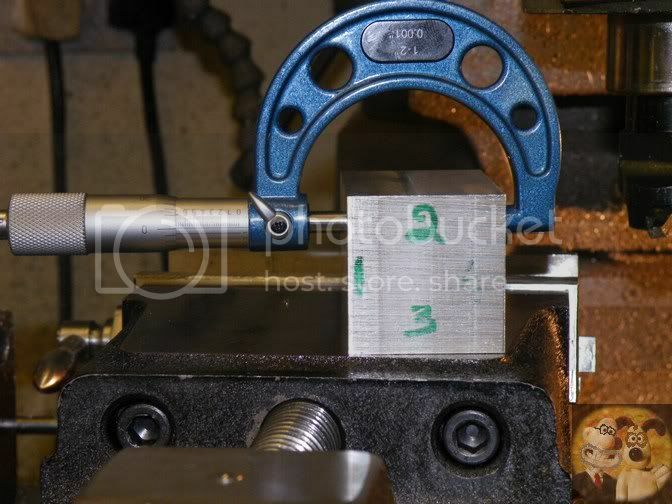 A piece of supplied exact to size ferrule is cut to length and fitted into the centre hole. 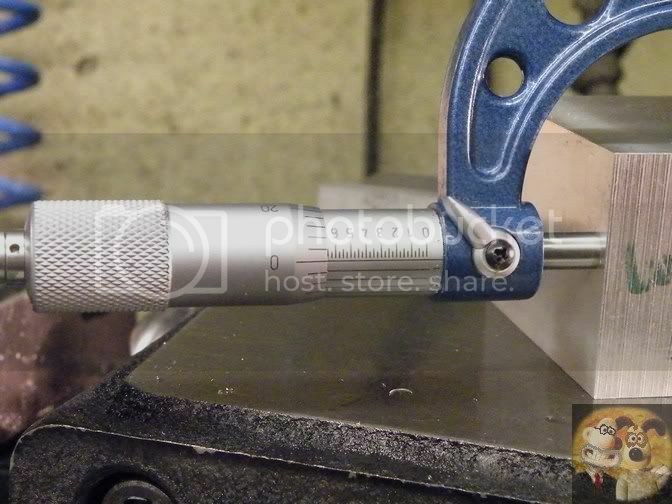 This hole is in fact reamed, and the ferrule should have been an interference fit, but it wasn't, just a tight push. So uncle Loctite came to the rescue and fixed it. At this stage three things had been completed. 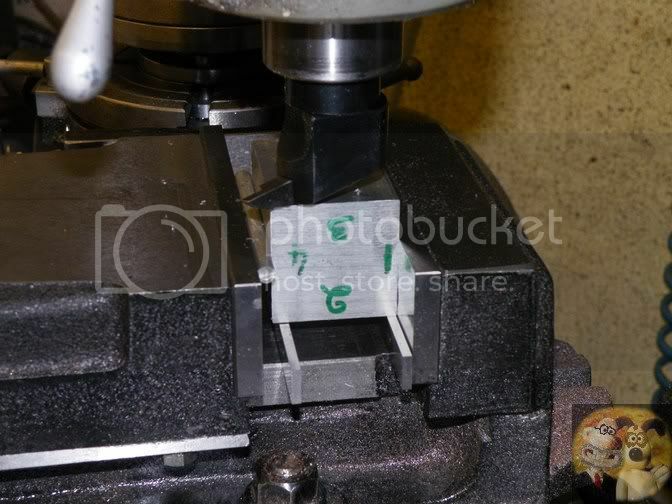 The first was to fit the ferrule in the centre hole flush with the top. 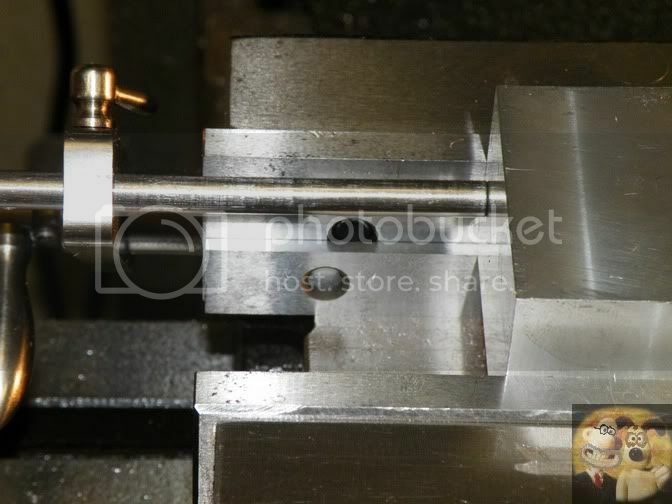 The second was to tap the far hole out to 3mm. In fact, again belt and braces, I fitted a helicoil in there, to me it makes the tightening of the screw a lot more rigid. 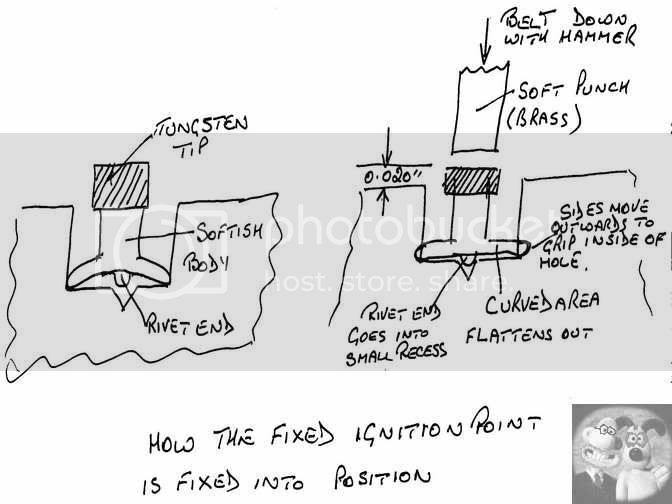 For the third bit, I had fitted the fixed point as shown in the above sketch. 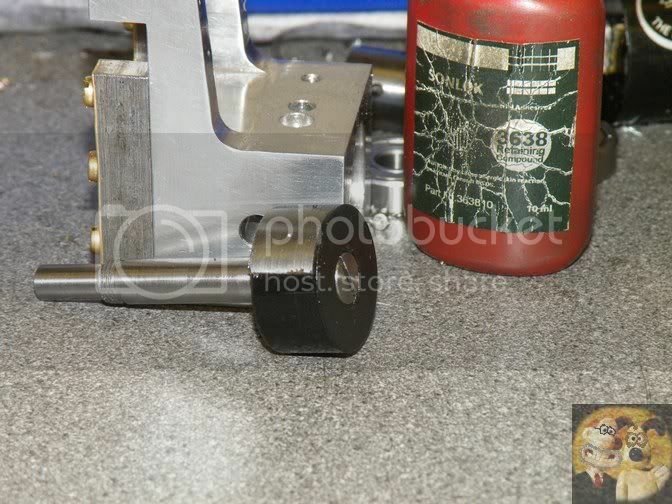 You will also notice a brown stick thing poking up out of the ferrule. 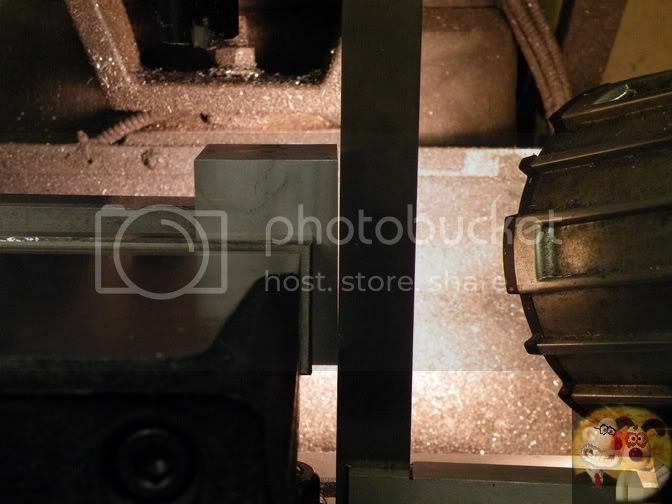 That is in fact a piece of Tufnol type rod, that when cut to the correct length will follow the cam and push up on the contact spring to make the points break, and so fire the stored energy in the coil. The points system was then made up to instructions from a bit of spring steel strip with two holes drilled thru it (no problems with that, just good tapping lube and a slow speed), and a couple of insulators, plus of course a screw and solder tag. I will just mention, in my supplied kit, if you are careful with the cutting, there was enough materials supplied to make up a replacement points part, just in case you buggered something up. But no spare tungsten points, so be careful with those. The operating pin isn't finished just yet, as I still have a couple of jobs to do that requires the minimag to be stripped down. The first is the optional back cover, but the other is one of my own. If you notice the upstands, I have carried on all the way through with the coil mounting screw holes and brought them out to the back. I have a fetish about cables vibrating and swinging about, maybe fracturing. 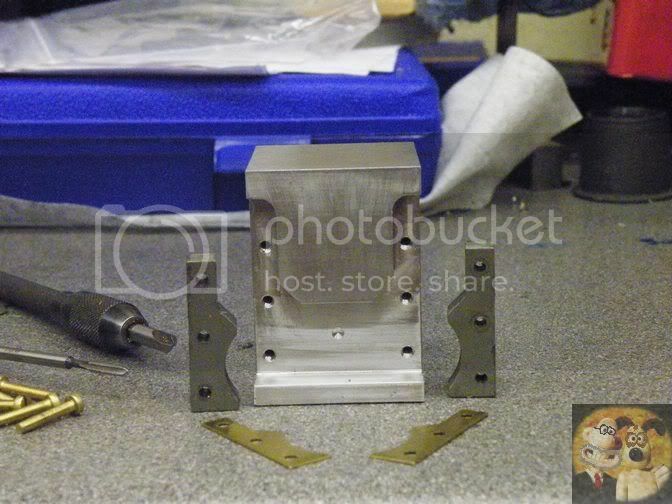 So I am going to use those two holes to hold some home made cable clamps, in keeping with the overall look. So other than those, the Minimag is finished. It just needs to be timed to get the maximum spark out of it. That will be done later. The back view, minus the cover plate. 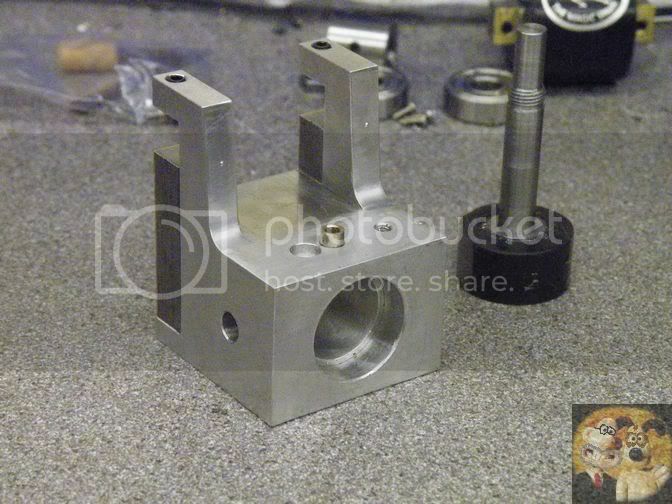 Next I will be making these extra bits, plus an operating stand to put it thru it's paces. So now the final winding up of the build. The plate that covers the rotor was made to drawings, and as you can see, it had to have a big hole in it to give the rotor somewhere to stick out into. I still thought it wasn't really swarf proof, so I turned up a disc with a very shallow spigot on it to fit into the hole and duly soft soldered it in. Unfortunately, I had to do a bit of bling as well, I couldn't help myself. So my trademark of concentric circles and a bit of playing about with my latest digital toy, my rotary table, I came up with this. The cable strain reliefs were made and fitted, just to stop the cable from flopping about all over the place due to vibration, and maybe later on causing a breakdown due to fracturing of the inner strands. 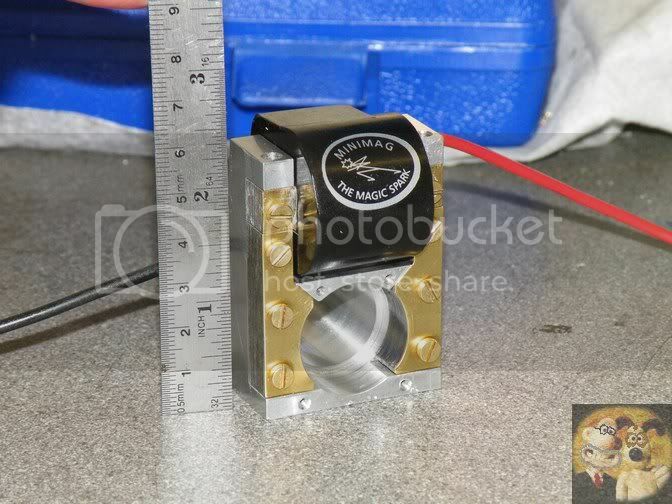 The test rig was then made up and the Minimag given a turning over. I tried to get a vid of it showing the sparks on the plug, but underneath the lights you couldn't see them hardly at all, and in the pitch black my camera wouldn't work, so my word will have to do. Because I didn't have an engine to try my Minimag out on, Julian very kindly cobbled together a mounting and has done a video of his Webster running with my Minimag doing it's own thing. The extra 'clicking' towards the end is radio interference. I hope you enjoyed the build as much as I did.